It is late November. The Germans are feeling the pinch. Leaves were cancelled and the end was no where in sight. 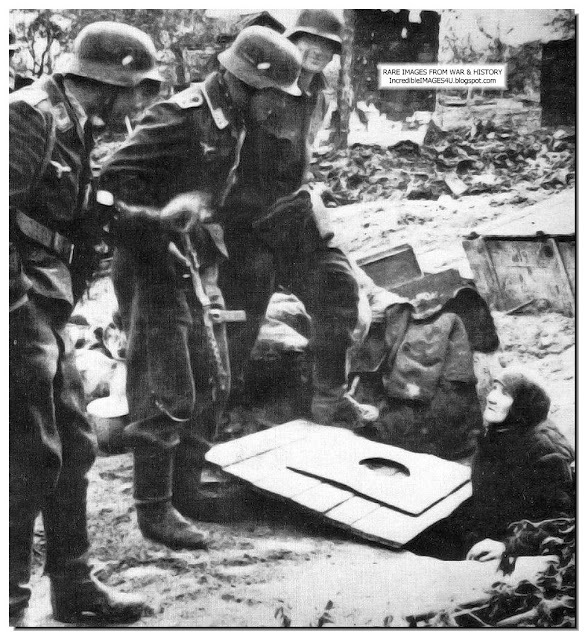 German morale was sagging. 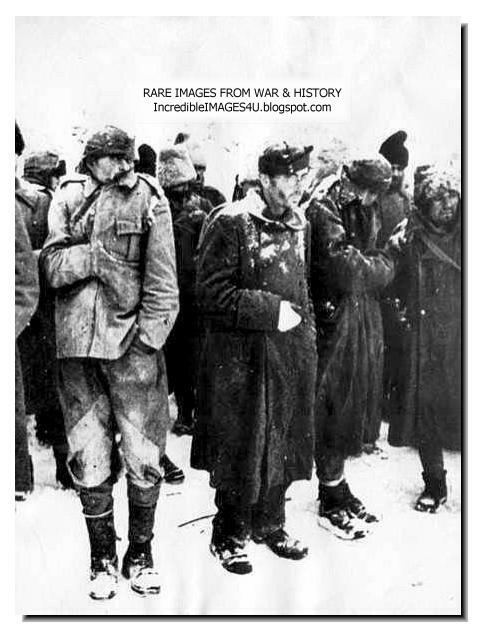 The faces of these soldiers in Stalingrad says it all. 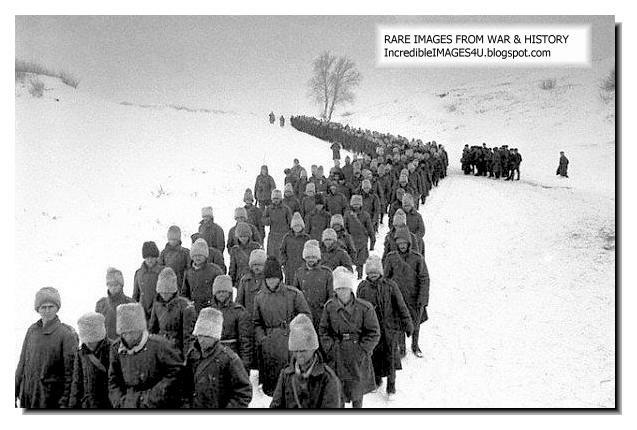 In the Autumn of 1942, the German Army had again succeeded in making large Territorial gains in Russia. However it had not captured the considerable amounts of men and material as had been the case in 1941. 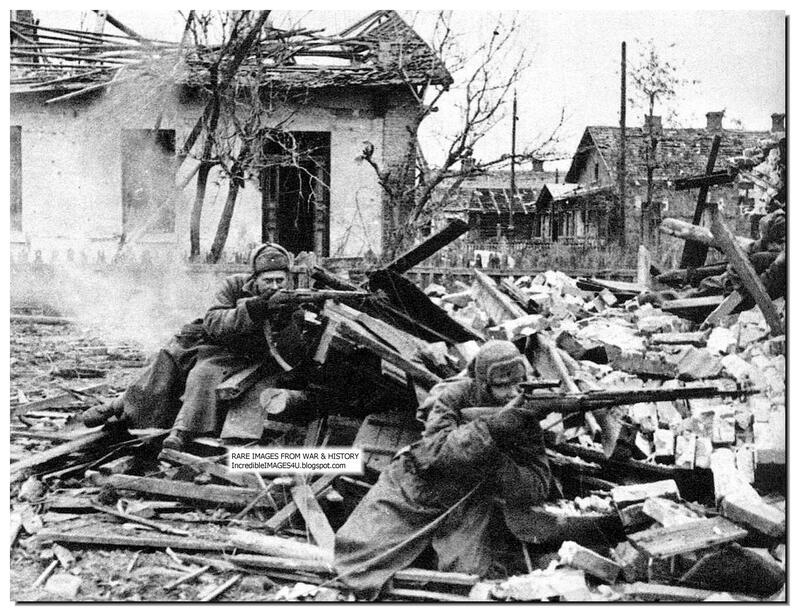 The German advance had again reached its limits and the Red Army was preparing to deal a series of counter offensives against it. 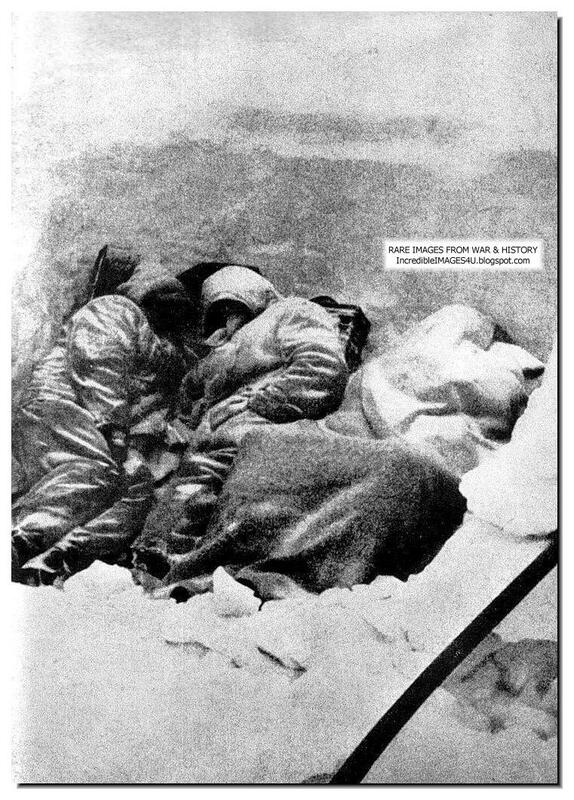 However before this could come about, a titanic struggle would ensue that would be centered on the city of Stalingrad. Hitler had become obsessed with the capture of the city that bore Stalin's name. Not only was the city an important armaments production center, river port and transport hub, but encapsulated all that Bolshevism stood for. Stalin meanwhile declared that the city should be held at any cost, issuing his infamous 'Not one step back' order in August. Once 6th Army's 51st Corps had crossed the Don River at Luchinsky and Vertyachy, only the beleaguered 62nd and 64th Armies, retreating back towards the city, lay between it and Stalingrad. On Sunday the 23rd of August the Luftwaffe carried out its first air raids against the city. The raids were devastating, with over 1000 tons of bombs dropped on the first day, destroying the city's telephone exchange, waterworks, the power station at Betovka, the oil storage site on the Volga and part of the main hospital, as well as large parts of the city's residential areas. The bombing continued for five days. The 16th Panzer Division advanced almost unopposed towards the city until it reached Gumrak where resistance began to stiffen. However the division managed to reach the Volga on the evening of the 25th of August at Rynok, to the north of the city. Meanwhile the Russians rapidly began to form Militia Battalions to help defend the city. To the south of the city the advance of the 4th Panzer Army, under Hoth, was facing more determined resistance from Russian forces around Lake Sarpa and in the Tundutovo Hills. 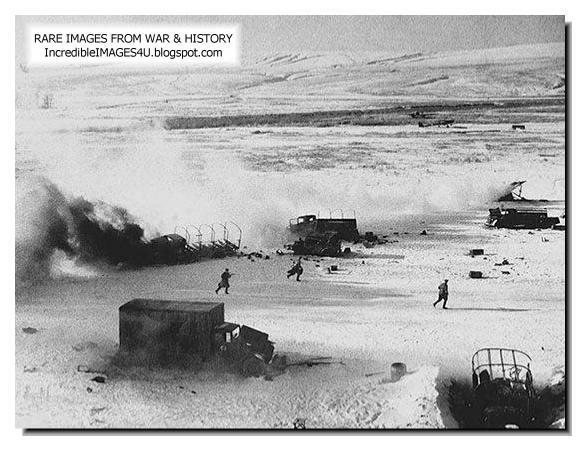 However, Hoth moved the 48th Panzer Corps to his left flank and it made rapid progress across the Kalmyk Steppe. By the evening of the 31st of August, units of the 24th Panzer Division had reached the Stalingrad-Morosovsk railway line to the southwest of the city. On the 3rd of September, Russian forces of the 1st Guards, 24th and 66th Armies were assembled on the northern flank of 6th Army in preparation for a counter attack. The Luftwaffe made concentrated attacks against the assembly areas, disrupting preparations for the offensive. 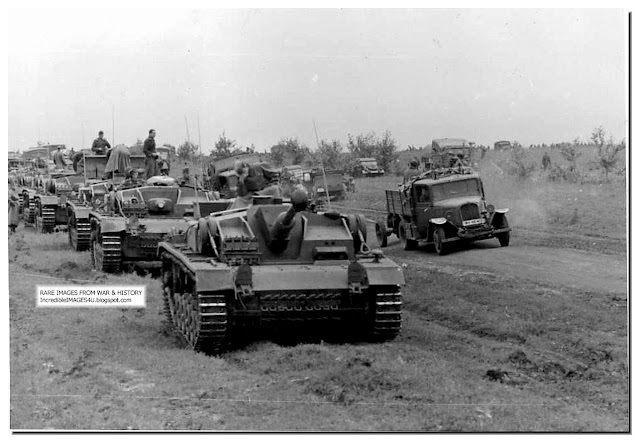 When it finally began on the 5th, the 14th Panzer Corps was prepared to meet it. The 1st Guards Army only managed to advance a few miles while the 24th Army was eventually pushed back to its start line. However despite the offensives failure, it did allow time for the 62nd and 64th Armies to withdraw back to the edge of the city. 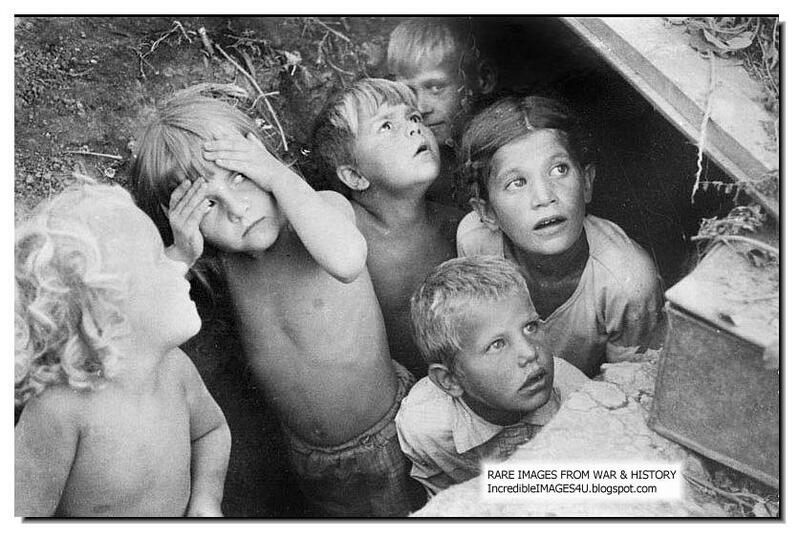 On the 10th of September the 62nd Army withdrew back into the city and was cut off from the 64th Army in the south by the advancing 29th Motorized Infantry Division, which reached the Volga at Kuporosnoye on the southern edge of the city. On the 11th of September the Front HQ was withdrawn to the eastern bank of the Volga. On the 12th, General Vasily Chuikov was appointed as the new commander of the 62nd Army. On the 13th of September, the German 6th Army made its fist attempt to break into the city. 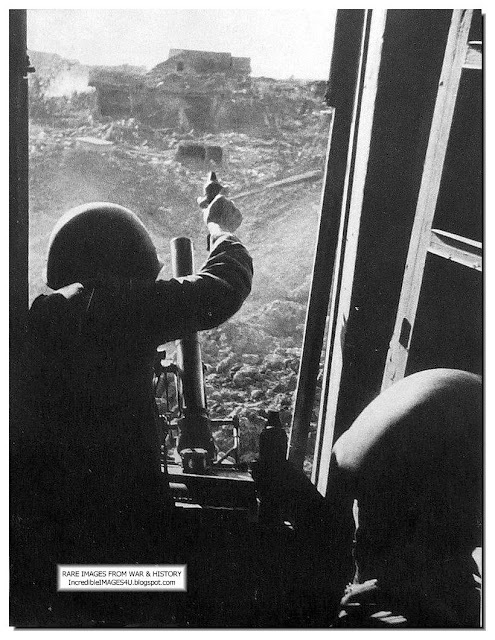 In the north of the city the 295th Infantry Division attacked the Mamayev Kurgan, a dominating height also known as hill 102, which overlooked the city. Meanwhile the 71st and 76th Infantry Divisions attacked towards the main railway station and the central landing stage on the Volga. 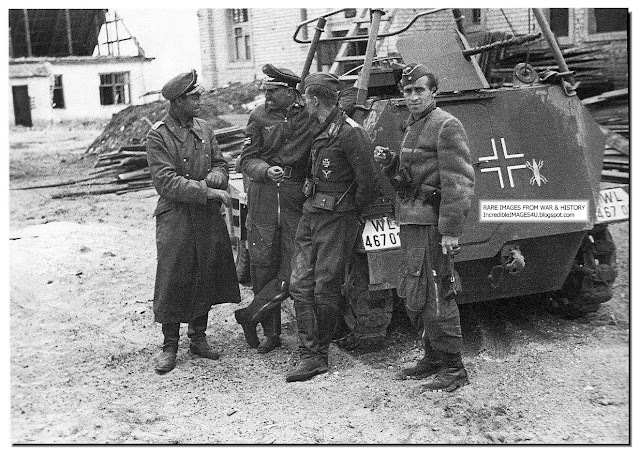 In the south of the city the 14th and 24th Panzer and the 94th Infantry Divisions attacked towards the area of the grain elevator. 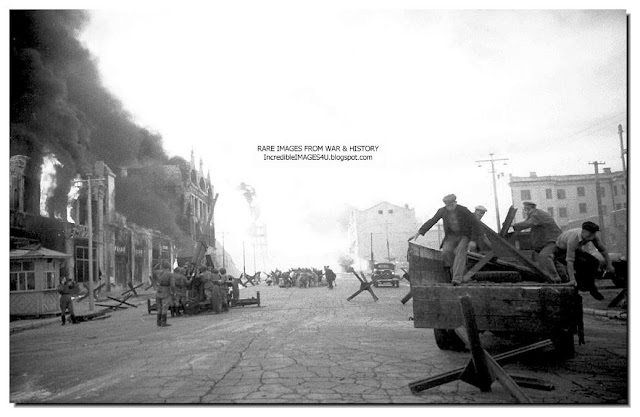 The attack was preceded by a sustained air bombardment and artillery barrage. The 71st and 76th Infantry Divisions made good progress, despite becoming bogged down in heavy fighting around the main railway station which changed hands several times that day. 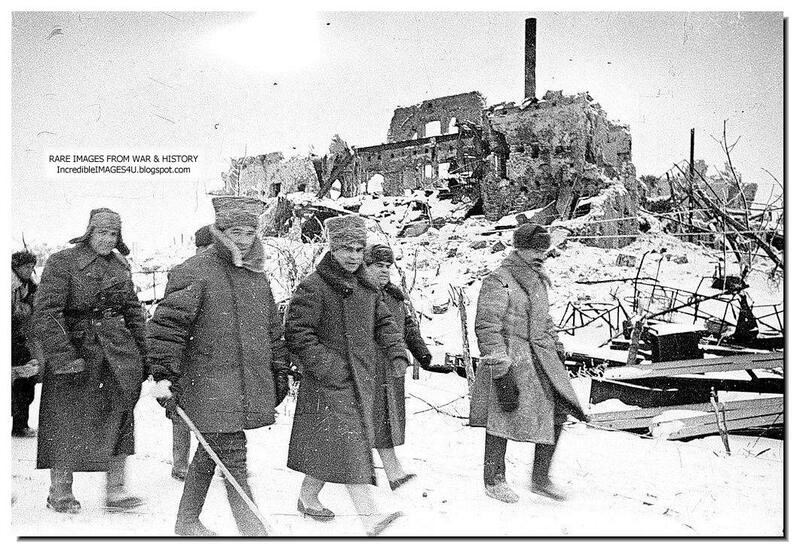 By late afternoon they had captured the waterworks and reached the Volga to the north of the station. Meanwhile the 29th Motorized and 94th Infantry Divisions attacked from the Yelshanka suburb, also in the direction of the Kurgan. 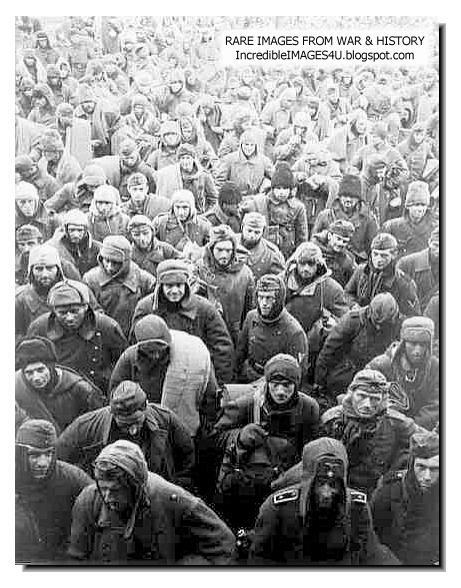 Stalin ordered that the 13th Guards Rifle Division was to cross the Volga and reinforce the city on the night of the 14th, the situation so desperate that it had to be introduced piecemeal as soon as units disembarked from the ferries. In the mean time, Chuikov moved militia Battalions under NKVD command to occupy key buildings in the city and hold them to the last man. A regular NKVD Battalion was sent to reinforce the Mamayev Kurgan and two Rifle Regiments ordered to block the German advance towards the river. The 13th Division crossed on a mixture of gunboats, tugs, barges, comandeered fishing vessels, even rowing boats. 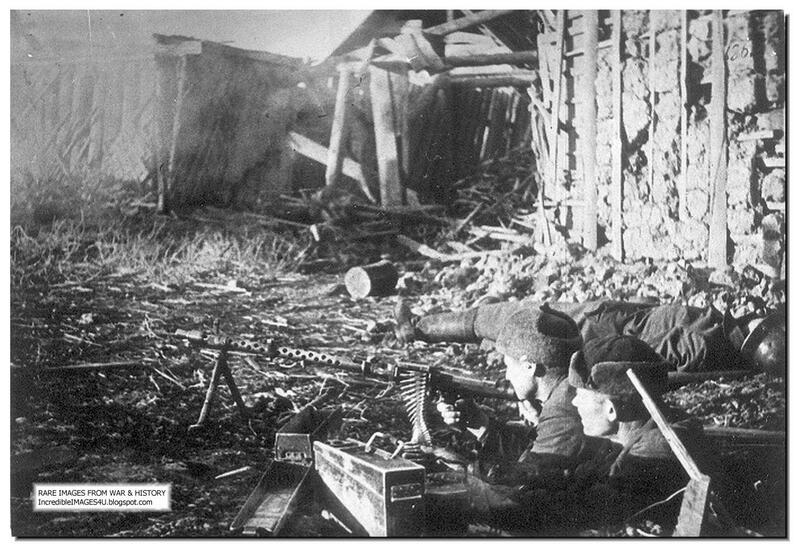 The first wave of troops across, the 42nd Guards Regiment, managed to push the Germans back towards the main railway station, while the 39th Guards Regiment captured a large mill and then pushed towards the Mamayev Kurgan. The 95th Rifle Division reinforced the badly weakened 35th Guards Rifle Division to the south of the Tsaritsa Gorge and a Brigade of Marine Infantry were sent to fortify the grain elevator. 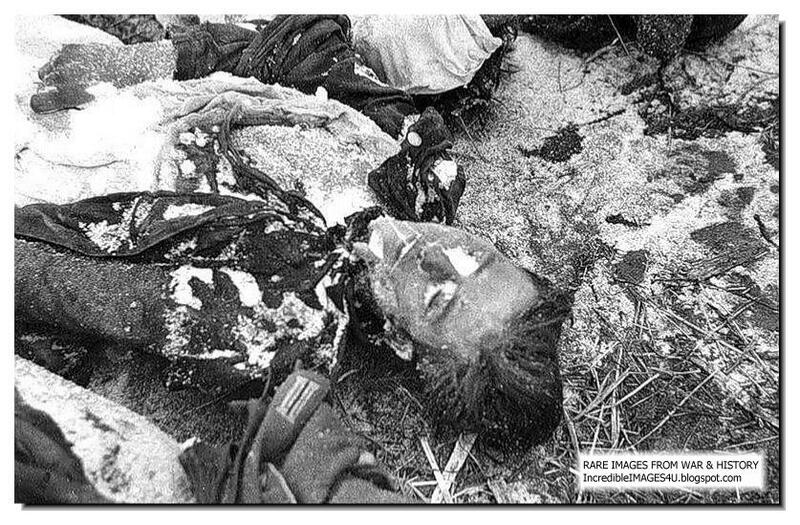 Meanwhile the NKVD Regiment on the Kurgan was struggling to hold on to the summit following repeated attacks by the 295th Infantry Division. 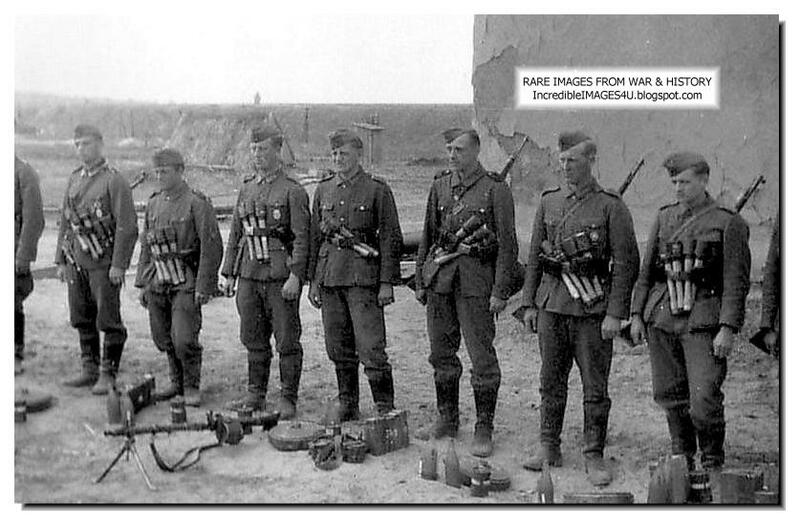 They were finally reinforced on the 16th of September by the 42nd Guards Rifle Regiment. On the 18th of September the German 94th Infantry Division began to assault the grain elevator. 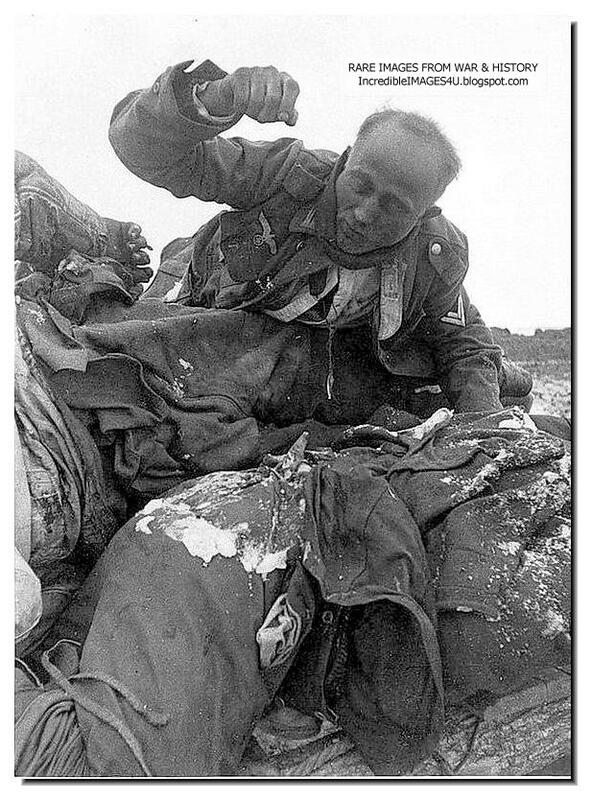 Despite continuous bombardment and ten separate attacks from the 94th Infantry Division, the elevator was held until the 20th, when the few survivors broke out and fought their way back to the Russian lines. 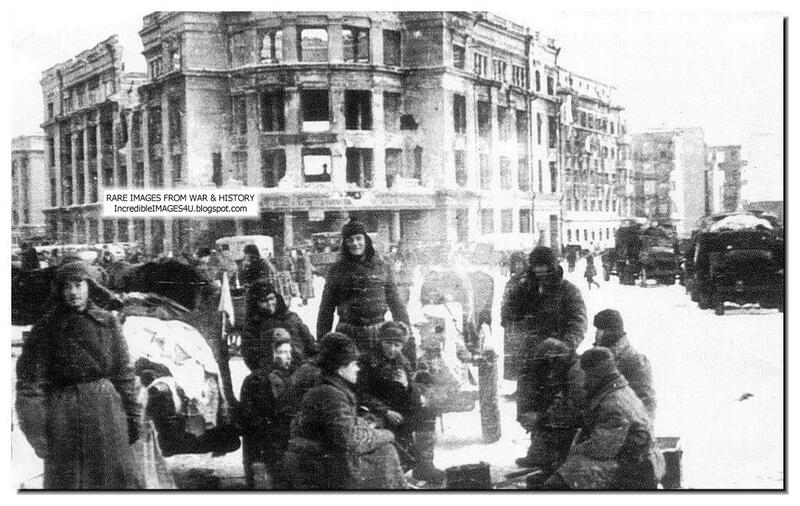 The Univermag department store on Red Square and the warehouse known as the nail factory also saw desperate close quarter fighting before they fell to German forces. 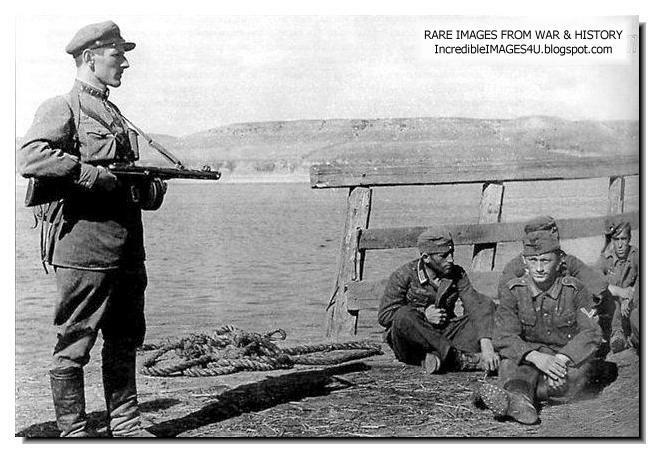 However despite the staunch defense of the Russian troops the Germans still managed to reach the central landing stage. The main station was also finally captured the same day after five days of heavy fighting. With the central landing stage under German control the Russians were dependent on the factory ferry crossing to the north. 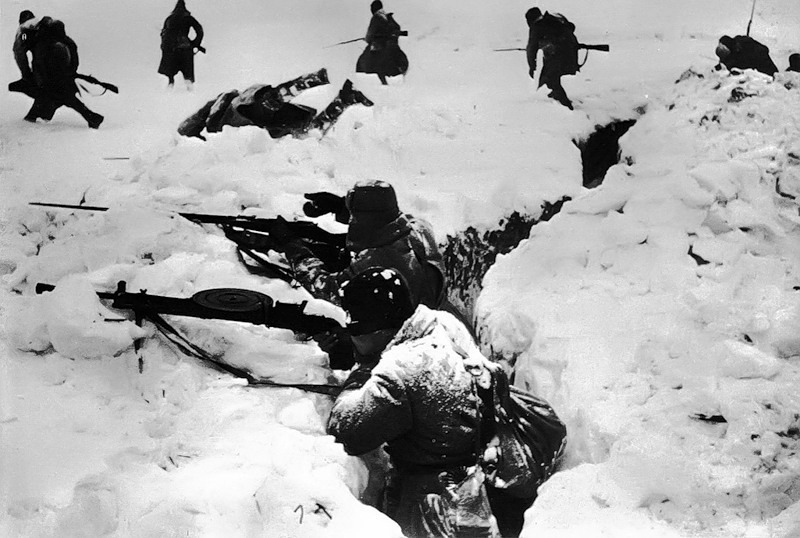 By the 21st only the 92nd Infantry Brigade was left fighting south of the Tsaritsa Gorge. That night the 284th Rifle Division crossed the river to reinforce the city. 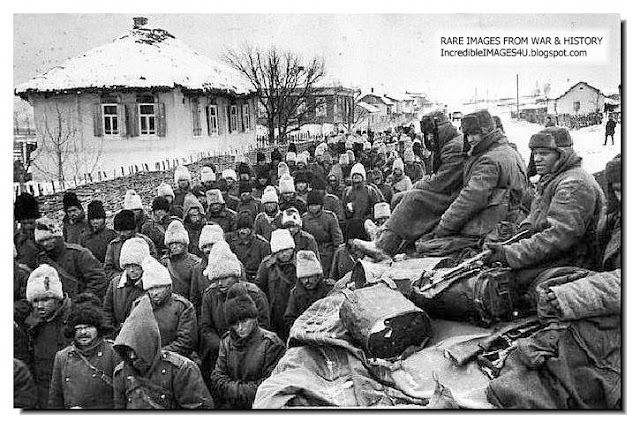 The Division was held in reserve behind the Kurgan until the 23rd when it counter attacked the central landing stage without success. On the 27th of September German forces launched yet another attack to destroy the Russian salient which reached westwards from the Volga in the industrial sector in the north of the city. 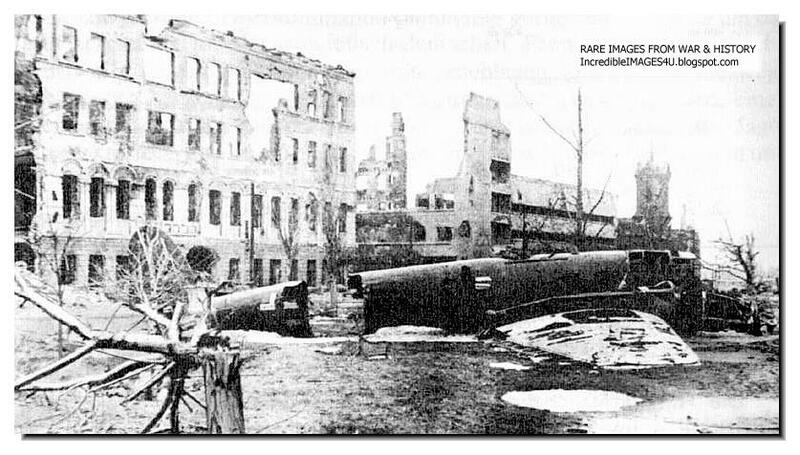 The capture of the Red October steelworks, the Barrikady armaments factory, the Lazure Chemical works and the Dzerzhinsky tractor plant were the objectives of this new attack. 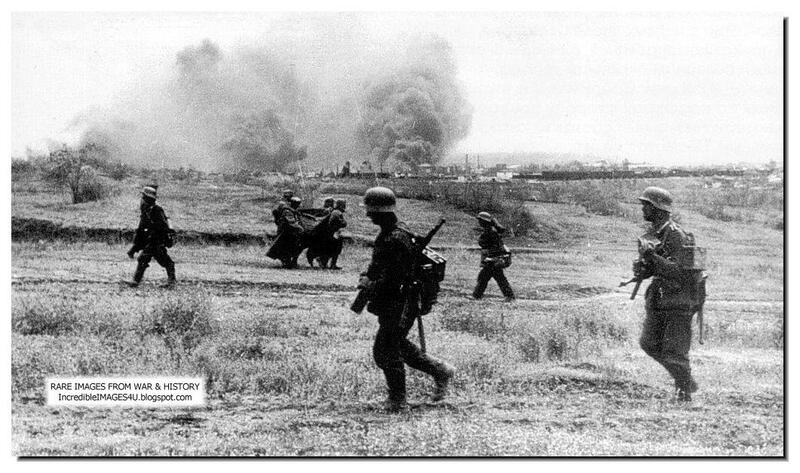 However Russian forces pre-empted the German offensive with spoiling attacks in the area of the Mamayev Kurgan. 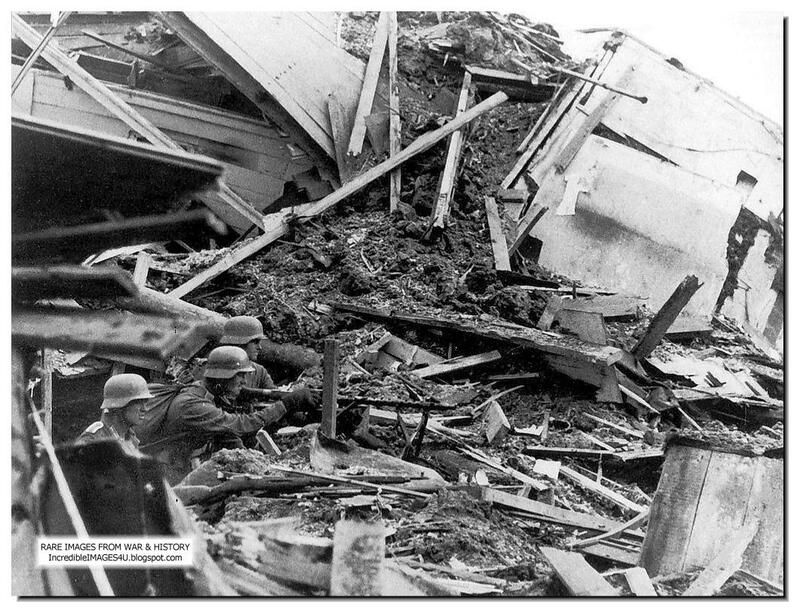 The 389th Infantryivision attacked the Barrikady workers apartments, while the 24th Panzer Division advanced towards the Red October factory. 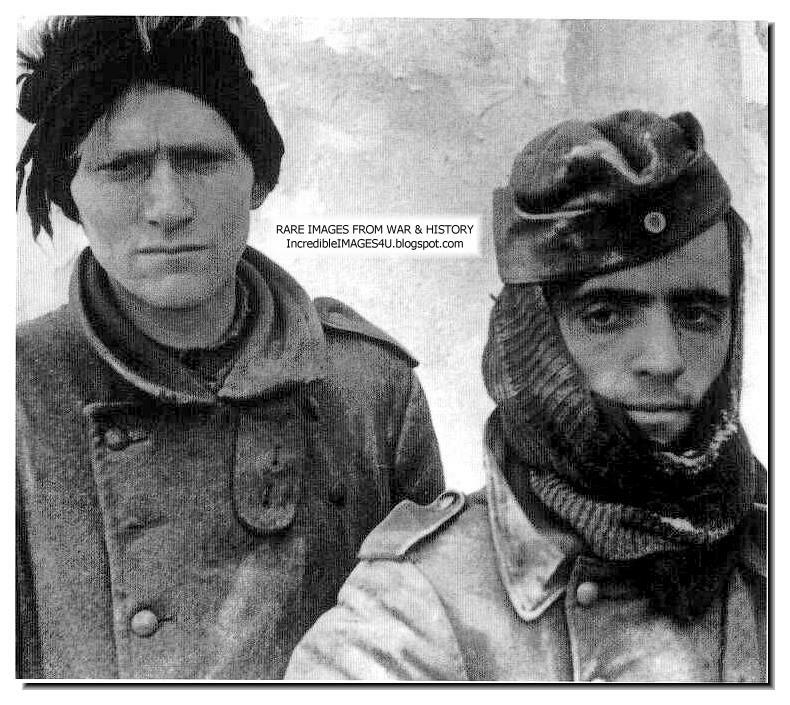 Further south 100th Jager Division recaptured the summit of the Mamayev Kurgan. 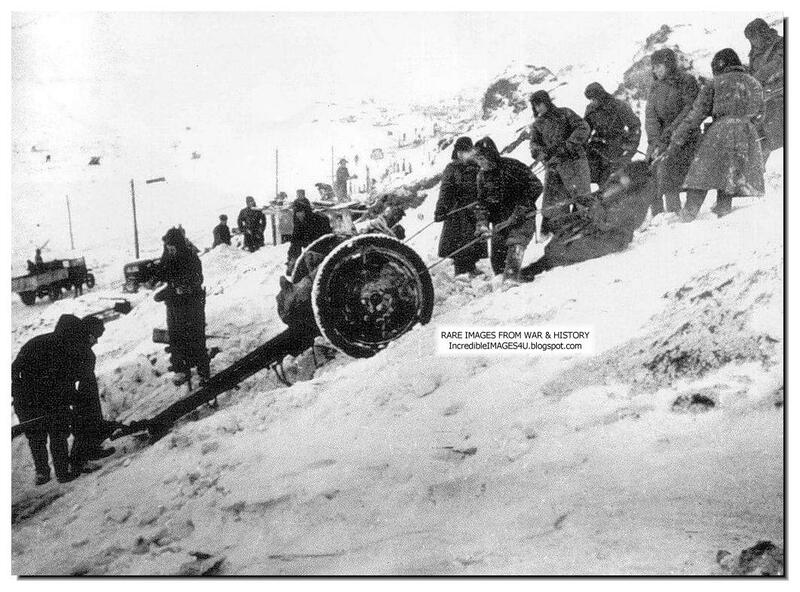 On the 28th of September, yet another Russian counter attack on the Kurgan threw German forces off of the summit. That night two Regiments of the 193rd Rifle and 39th Guards Rifle Divisions crossed the river to help reinforce the city. On the 29th of September, German forces began to reduce the Russian salient in the north of the city. 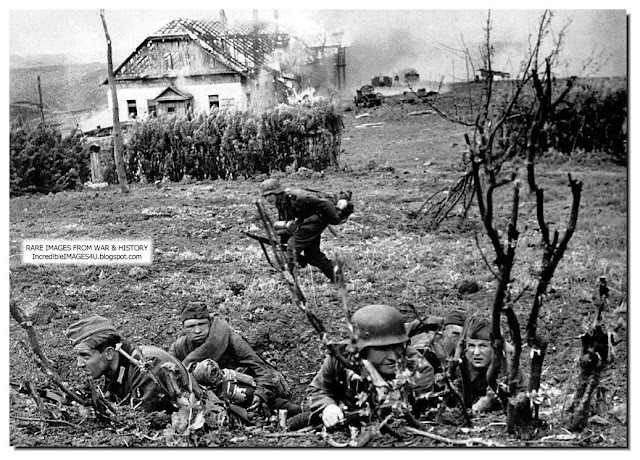 The village of Orlovka was attacked by the 389th Infantry and 60th Motorized Divisions simultaneously. In addition the 94th Infantry and 14th Panzer Division's were also moved up from the south of the city to support the attack. 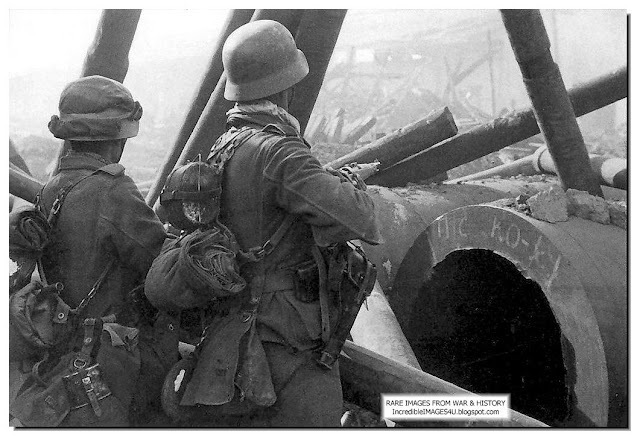 That night the 39th Guards Rifle Division crossed the river to reinforce the Red October steelworks. 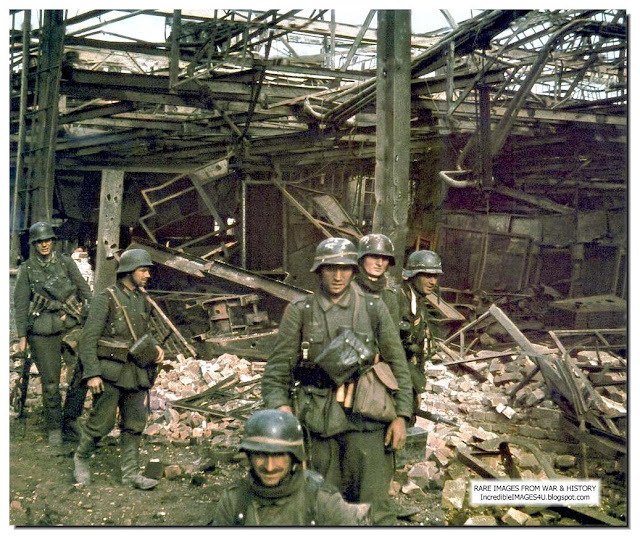 Hauptmann Friedrich Winkler (Friedrich Konrad Winkler) of the 305th Infantry Division in the area of Stalingrad factory. Winkler was taken prisoner and died shortly thereafter in a POW camp in Beketovka. On the 1st of October, units of the 295th Infantry Division infiltrated the northern flank of the 13th Guards Rifle Division along the Krutoy gully and reached the Volga. They then turned south and attacked the rear of the Russian Division. 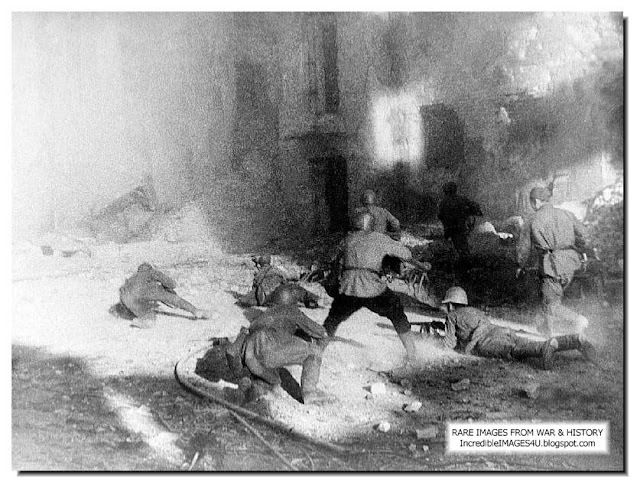 Every unit that could be spared was thrown into a desperate counter attack which finally halted the German advance. On the 2nd of October the Luftwaffe attacked the Oil storage facility, almost totally destroying it. 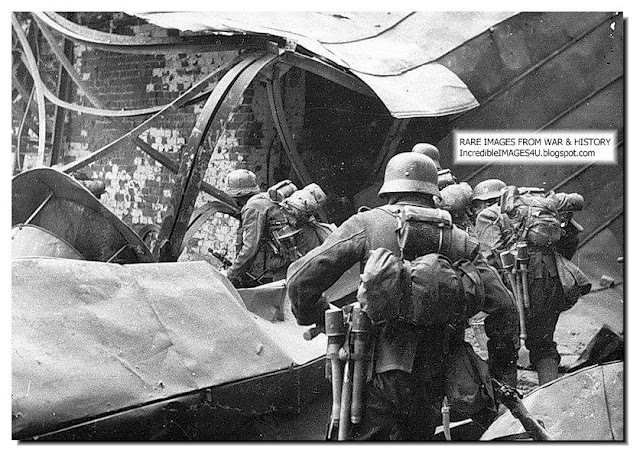 Meanwhile in the factory district, German attacks against the Barrikady Factory, defended by the 308th Rifle Division, and the Red October plant by the 414th Anti Tank Division, were making little progress. 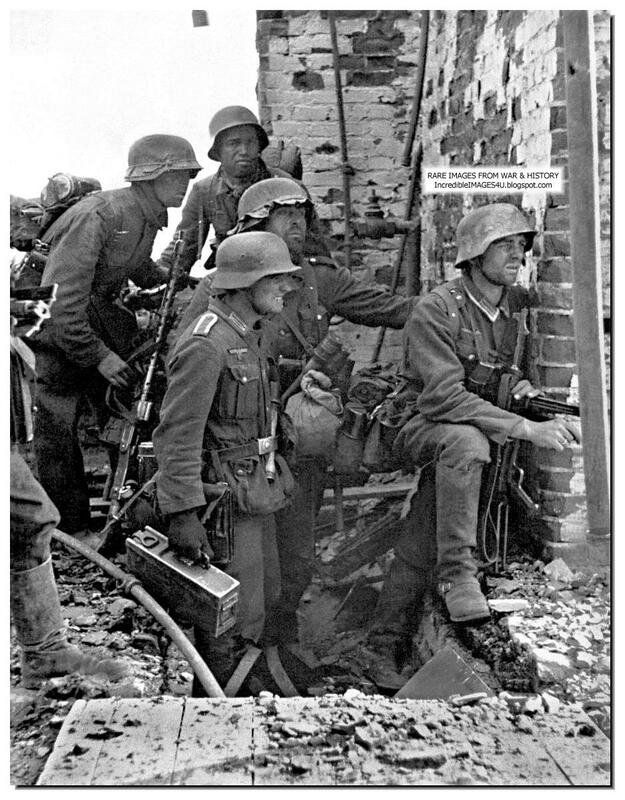 On the 6th of October the Germans renewed their efforts against the factory district. 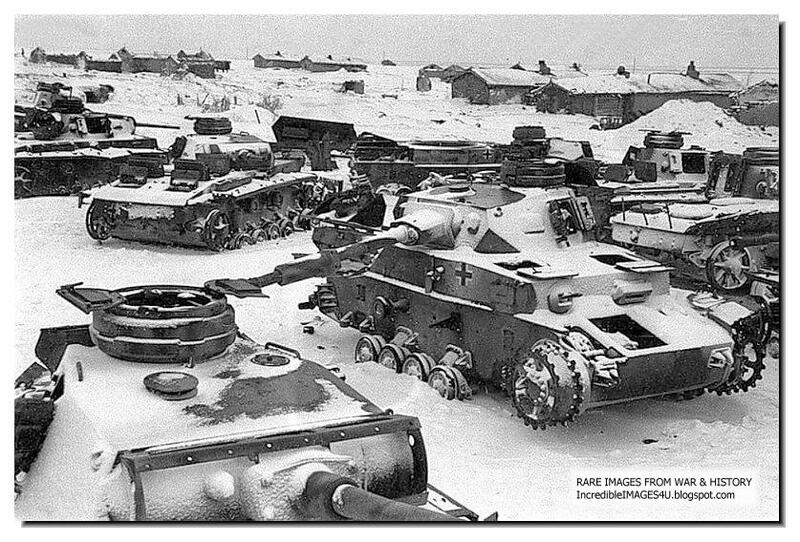 The 60th Motorized and 14th Panzer Divisions attacked the Tractor factory. 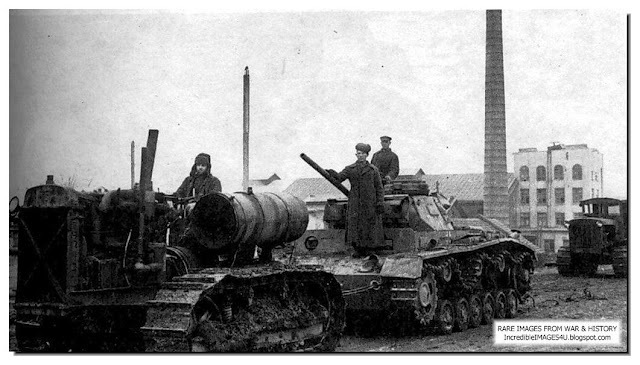 At the same time the 16th Panzer Division attacked the northern industrial suburb of Spartakovka, pushing back the remains of the 112th Rifle Division and the 124th Special Brigade. 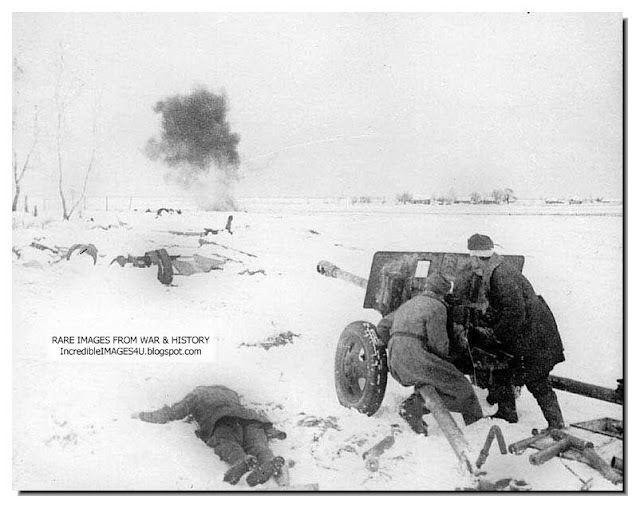 The Volga crossings were becoming increasingly vulnerable, constantly under fire from German artillery. On the 11th of October the 84th Tank Brigade and the 37th Guards Rifle Division counter attacked the 14th Panzer Division on the southwestern side of the tractor plant. The second week of October saw a lull in the fighting as the Germans prepared for yet another offensive against the northern industrial sector. The Germans began their offensive on the 14th of October. The objective again was the northern industrial sector. The main thrust against the tractor plant began at midday after a heavy arial bombardment of the Russian positions by the Luftwaffe. German forces of the 14th Panzer Division broke through the Russian defences and cut off the 37th Guards and 12th Rifle Divisions, reaching the Volga near the oil tanks. 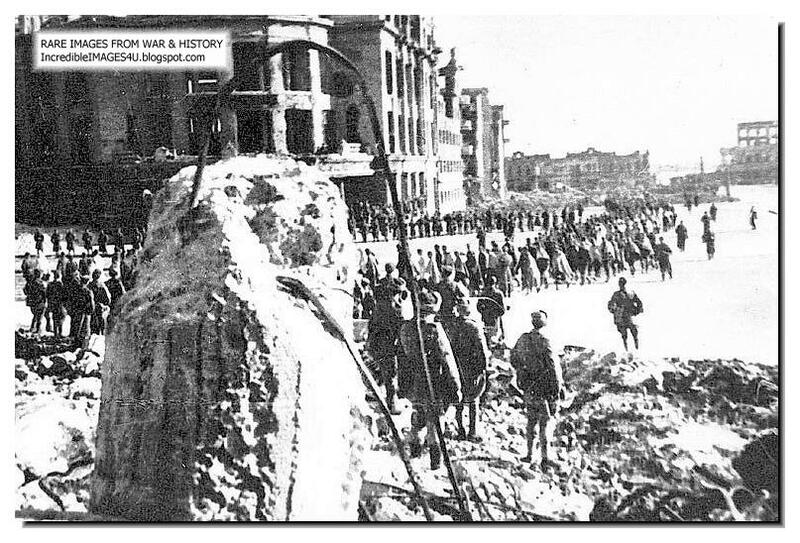 Further south on the 15th, the 305th Infantry Division reached the rail line by the brick works. The offensive petered out towards the end of October due to a lack of ammunition and exhaustion of the troops. 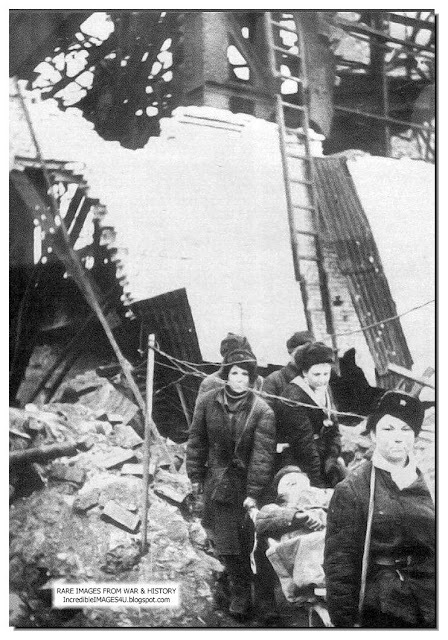 An attack on the 1st of November by the 79th Infantry Division against the Red October factory collapsed following a series of heavy artillery bombardments by Russian artillery. The 94th Infantry Division attacking the northern pocket at Spartakovka also floundered in the face of stiff Russian resistance. On November the 9th the harsh Russian winter arrived in earnest, as the temperature dropped to -18°C. The Volga, one of the last rivers in Russia to freeze began to clog with ice flows. On the 11th of November the final German assault began. Battle groups assembled from the 71st, 79th, 100th, 295th, 305th and 389th Infantry Divisions attacked the remaining pockets of resistance. 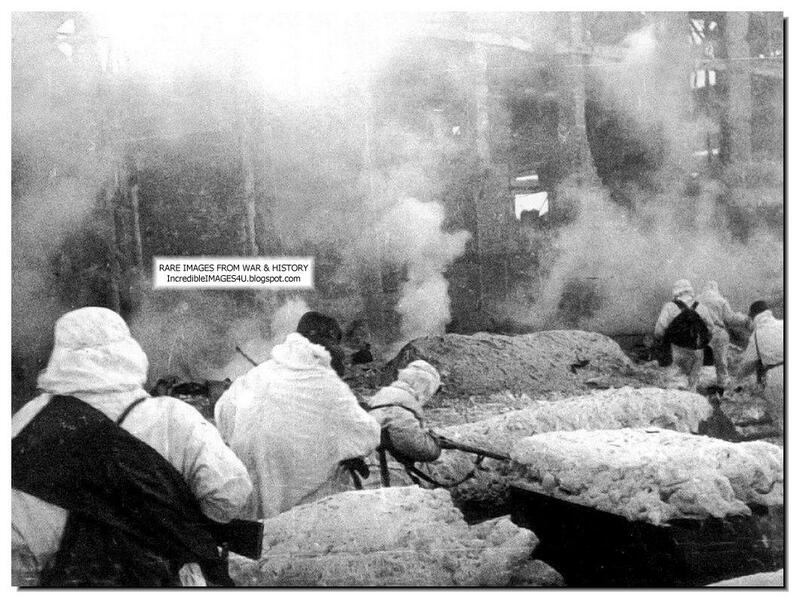 An airel bombardment opened the offensive, which thrust towards the Lazur Chemical factory and the Mamayev Kurgan. While the Russian 138th Infantry Division fought desperately to hold on to their position to the east of the Barrikady plant the 95th Rifle Division counter attacked to the plants south east, but was halted by heavy German shelling. Within 48 hours the main thrust of the attack had disintigrated into a series of isolated battles. 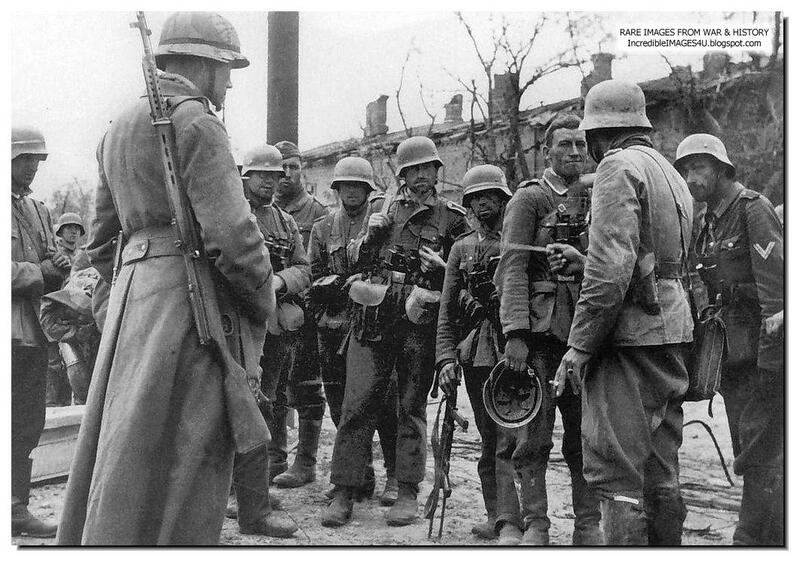 Small groups of German infantry reached the Volga, but were then cut off themselves as Russian forces infiltrated their rear. By the 18th exhaustion and a lack of ammunition saw the attack come to an end. On the 19th of November Russian forces of three Fronts begun Operation Uranus, the encirclement of German forces in Stalingrad. The reaction of the German forces in the pocket was slow. 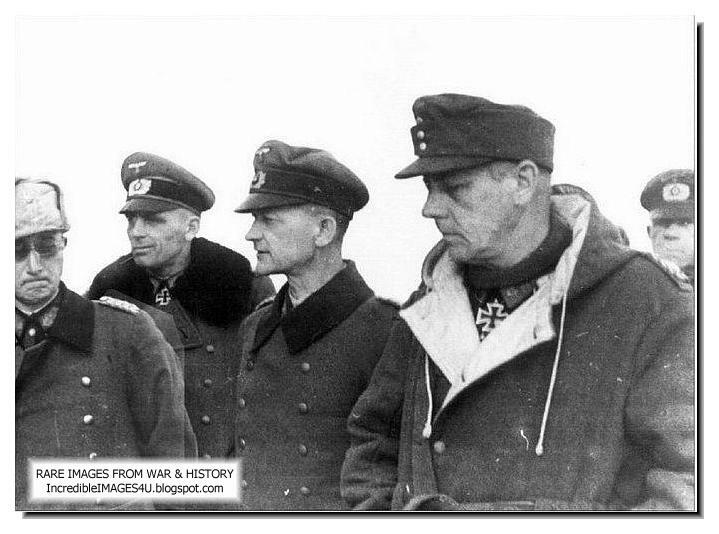 General Paulus, commander of 6th Army sought freedom of movement to break out of the pocket, but instead was ordered by Hitler to hold and await relief, while in the meantime the pocket would be re-supplied by air. 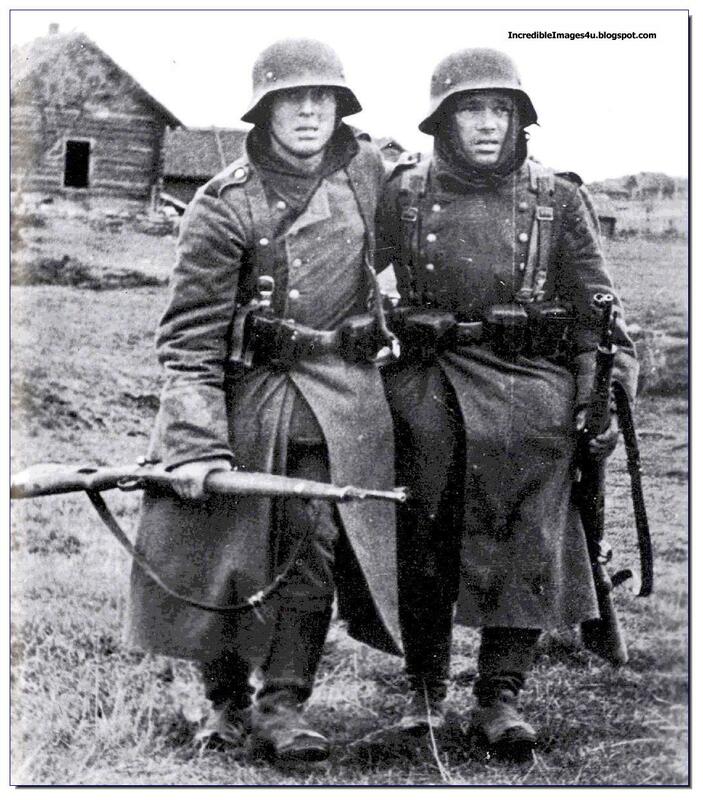 On the 23rd of November Von Seydlitz, commander of 50th Corps, ordered the 60th Motorized and 94th Infantry Divisions to withdraw from their positions on the northern edge of Stalingrad to a new defence line further back into the pocket. The first supplies were flown into the pocket on the 24th of November. The forces in the pocket realistically required a minimum of 770 tons of supplies per day. Despite the requirements of the army, the Luftwaffe was instructed to deliver was a mere 300 tons per day, but even this amount was never achieved. The first three weeks saw an average daily tonnage of 70 tons being delivered. Every possible type of aircraft was employed by the airlift to try and achieve the tonnage's required. The aircrews flew in atrocious weather conditions, through heavy anti aircraft fire and trying to avoid a heavy Red Air Force presence. Despite their efforts the highest daily amount of supplies, 289 tons, was achieved on the 19th of December. The next day the forward airfield at Millerovo was lost and Tatsinskaya four days later on the 24th. This increased the flying distance into the pocket to 330km, leaving most transport aircraft at the edge of their range and without fighter cover. On the 16th of January the Pitomnik airfield inside the pocket was captured and this only left the hastily prepared field at Gumrak. The daily average of supplies brought in dropped to a meager 100 tons, about 33% of the minimum requirement. 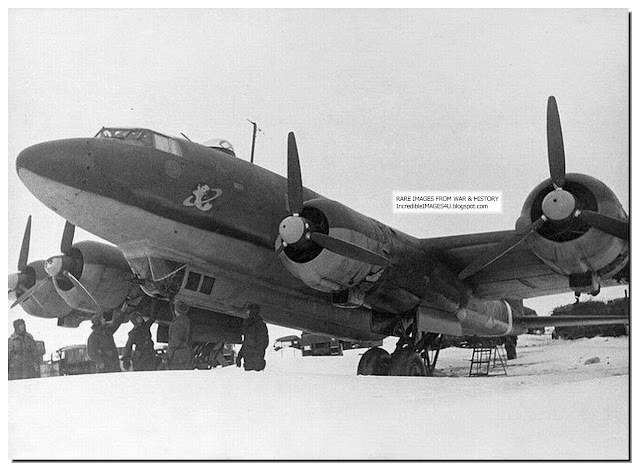 The airfield at Gumrak was overrun on the 23rd of January and the last aircraft remaining in the pocket flew out that day, with all supplies thereafter being air dropped. 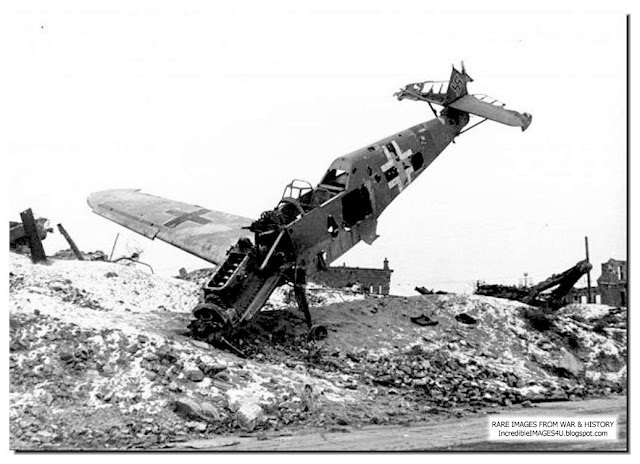 In support of the airlift from mid November to the end of January, the Luftwaffe flew 18,500 sorties, carried a total of 6100 tons of supplies, flew out about 25,000 wounded and lost a total of 488 aircraft. 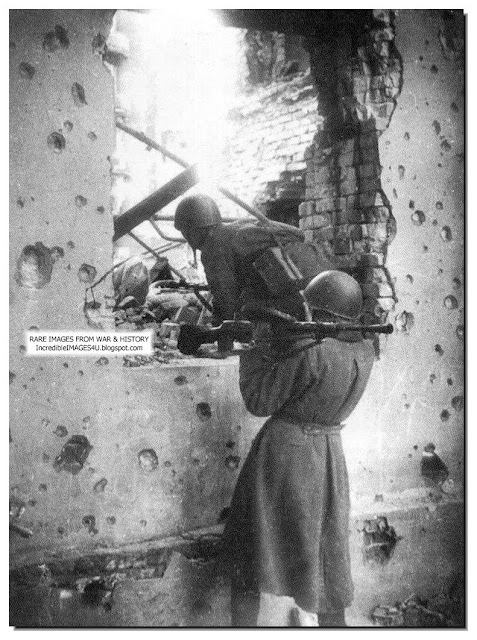 The Soviet soldiers fighting in one of the shops of the plant "Red October". Inch by inch the men occupy the factory area. January 1943. 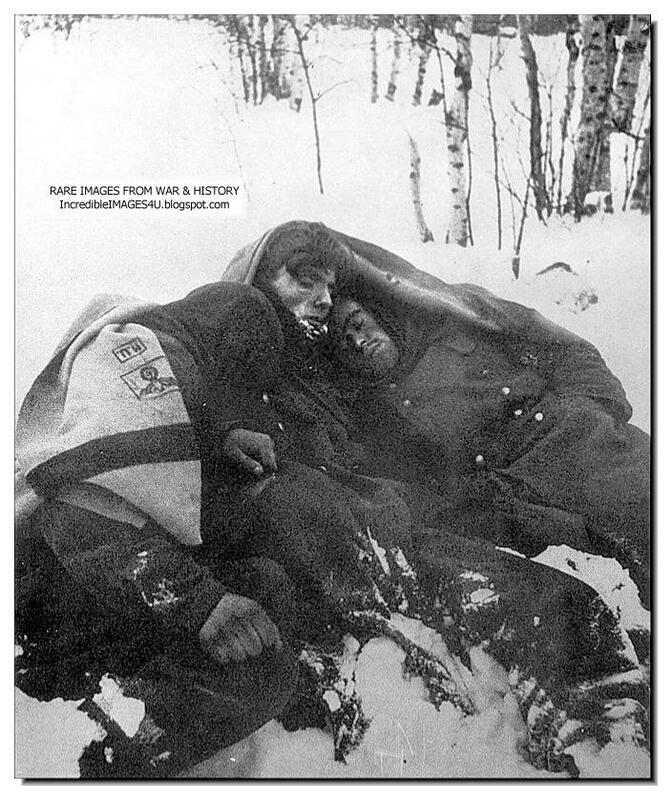 During the first week of December, Russian forces made a determined effort to split the pocket. 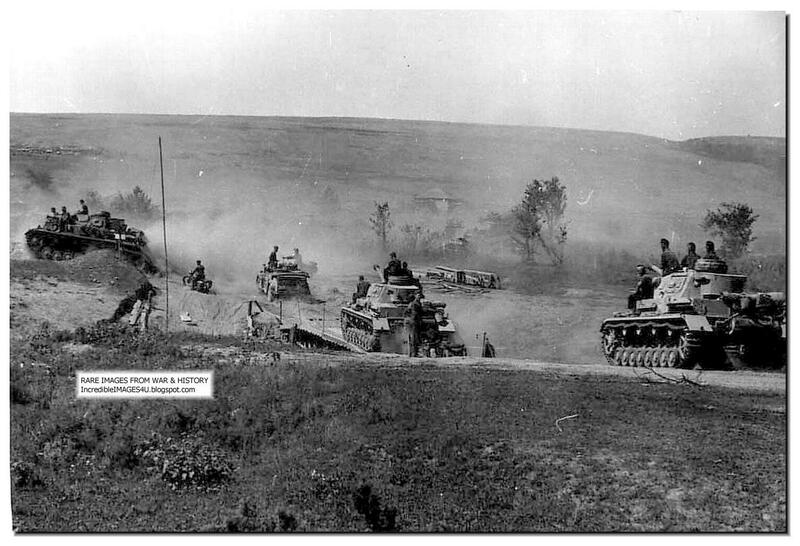 The 16th Panzer Division counter attacked a hill in the area of Baburkin. Despite capturing the hill the Russian's counter attacked and forced them back inflicting heavy casualties. By the 7th of December it was clear that the airlift would not be able to provide sufficient supplies of food, fuel and ammunition. 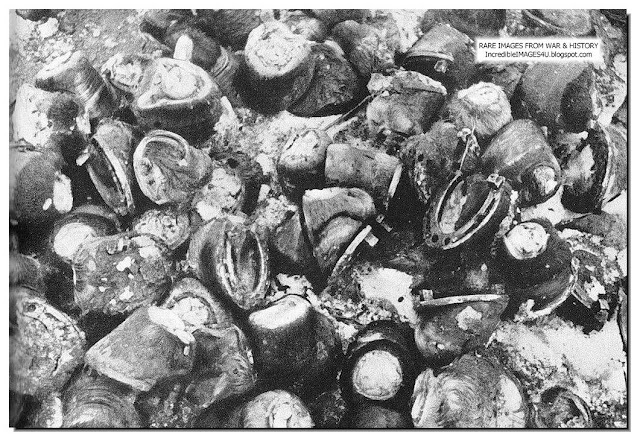 Rations within the pocket were cut by half and shortages of fuel and ammunition were seriously hampering 6th Army. 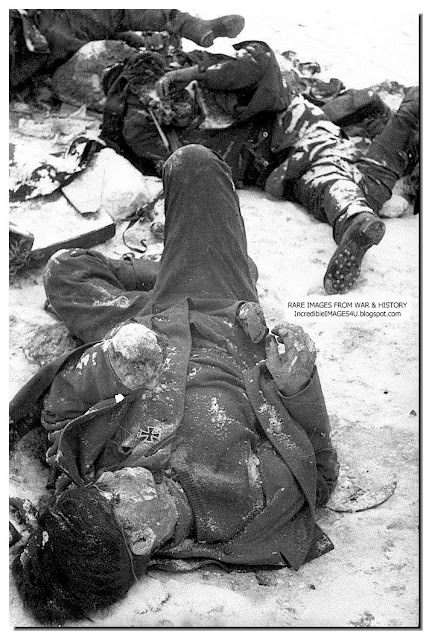 Manstein's relief attempt to free 6th Army from the pocket began of the 12th of December. 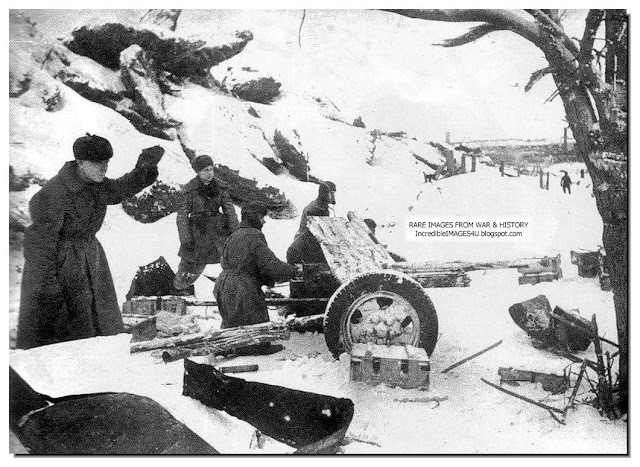 However by the 19th of December the 57th Panzer Corps was held on the Myshkova River by the 2nd Guards Army, only 40 miles short of reaching the pocket. The worsening situation along the entire Don River saw the relief attempt abandoned on the 23rd of December, effectively ending any chance of 6th Armies escape. 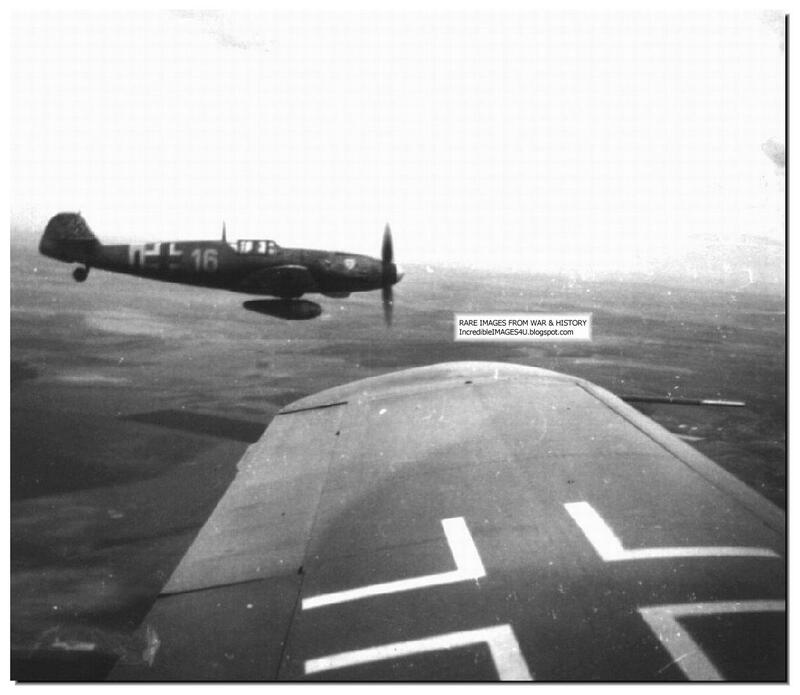 The following day the German forward airfield at Tatsinskaya was over run and the Luftwaffe aircraft attempting to re-supply German forces in Stalingrad were forced to fly from further afield and from makeshift airfields. 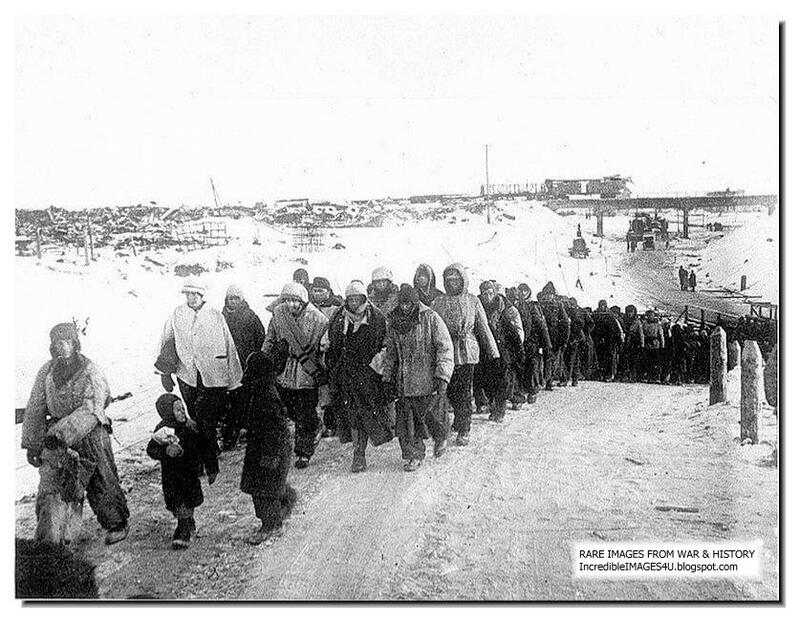 A week earlier the Volga had finally frozen over and the Russians had begun to pour reinforcements and supplies into the city and evacuate the wounded. The Germans no longer had sufficient artillery ammunition to shell the crossings. On the 7th of January an offer of surrender was made to 6th Army. 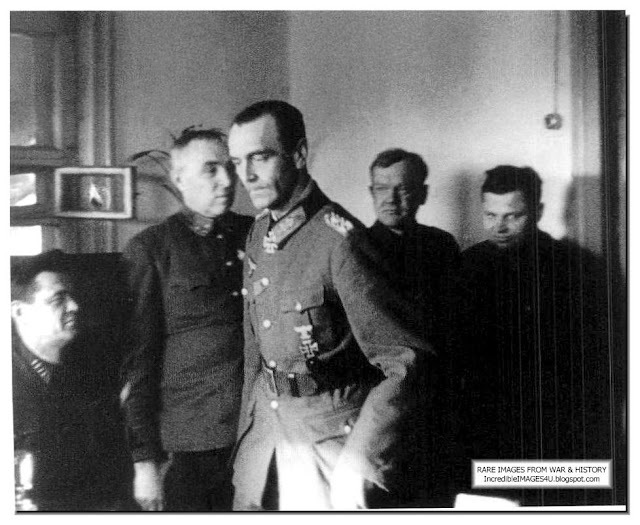 A draft of the surrender proposal, written by Voronov and approved by Stalin was sent via the Don Front HQ. 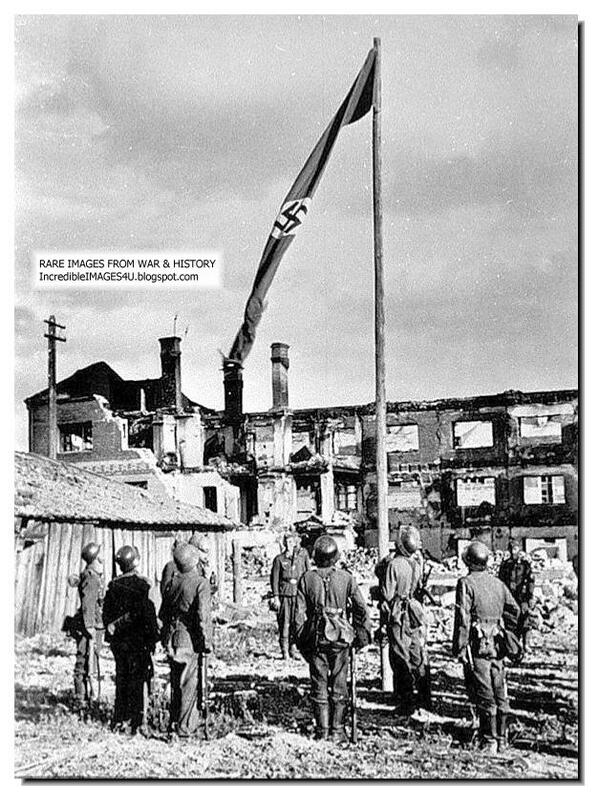 The previous night leaflets were dropped over the German lines and Red Army radio stations also broadcast the message. 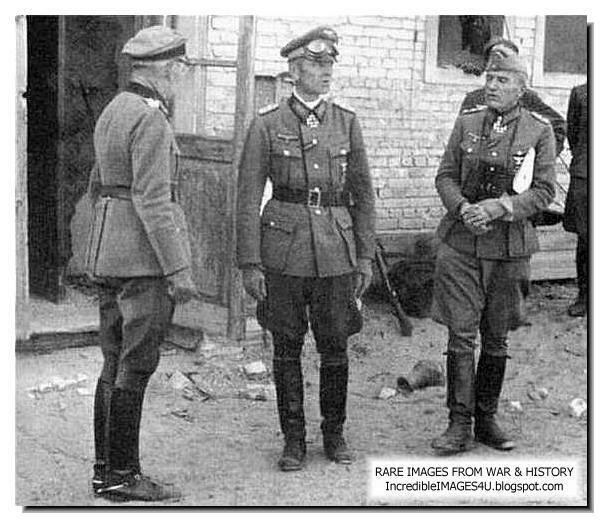 Despite the Russian envoys reaching German lines and being received by the Company HQ there, they were ordered to leave once the Battalion commander had phoned the Army Group HQ for instructions. They were not allowed to hand over the ultimatum and were returned unharmed to their own lines. This Russian performs a very vital duty. 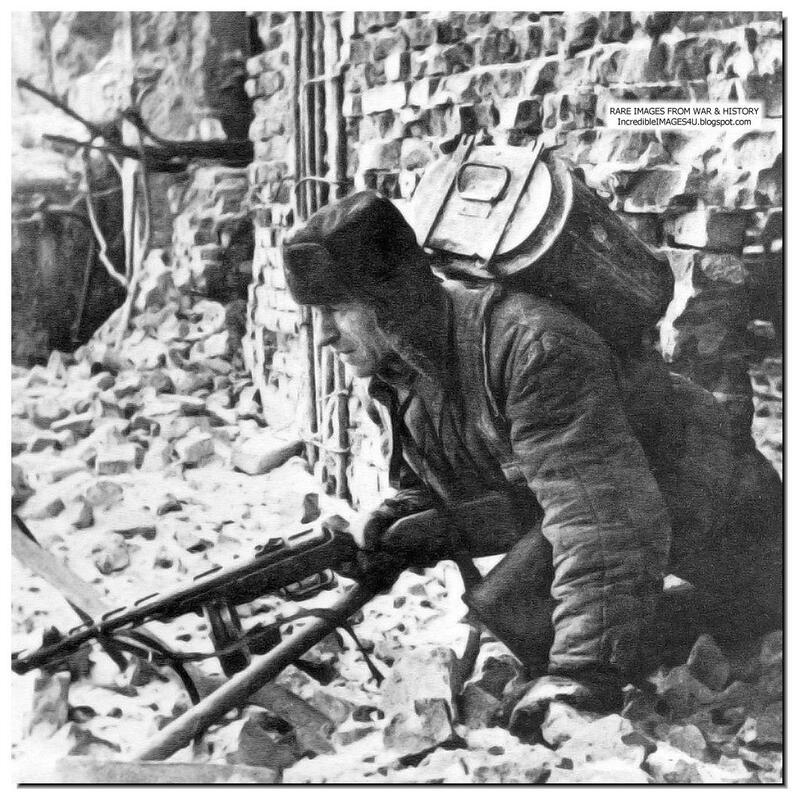 Gun in hand and a food tiffin on his back the man crawls through the ruins of Stalingrad to give food to the Soviet soldiers fighting at the "front line"
The Russian's began their final assault on the pocket, 'Operation Koltso' (Ring), on the 10th of January. It commenced with a ferocious bombardment using 7000 artillery pieces, which lasted for an hour. The south western tip of the pocket bore the brunt of the first Russian attacks as the bombardment subsided. 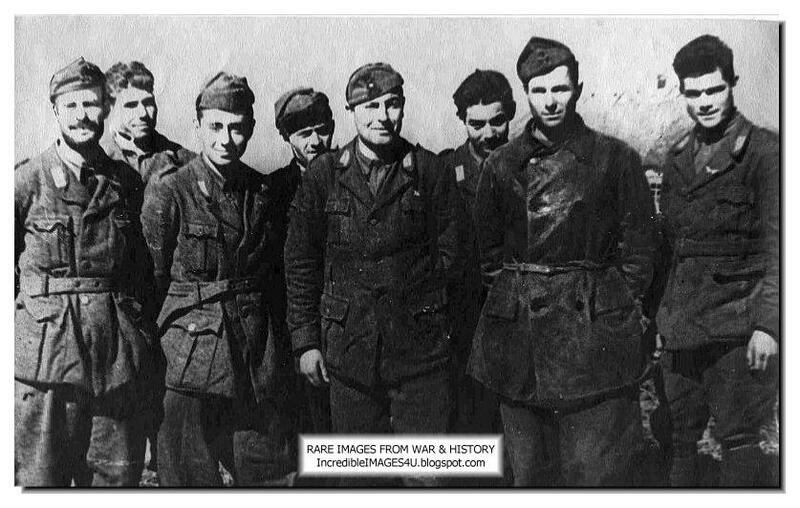 The 3rd and 29th Motorized and 44th Infantry Divisions were rapidly forced to retreat towards Karpovka station under the overwhelming assault of the 21st and 65th Armies supported by ground attack aircraft from the 16th Air Army. 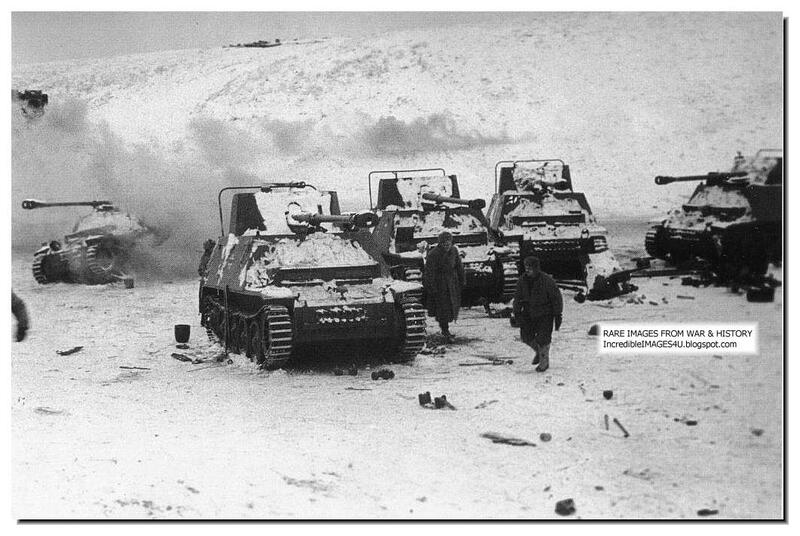 Meanwhile the northern flank of the pocket defended by the 16th Panzer and 60th Motorized Divisions, was attacked by the 66th Army. 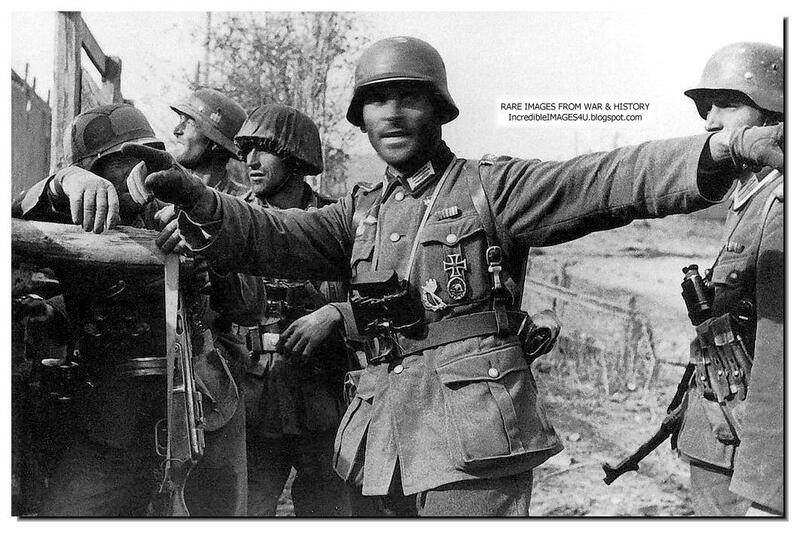 German forces here fared better, holding the initial Russian assaults. On the southern flank, 64th Army almost broke through a gap as a Romanian Regiment attached to the 297th Infantry Division collapsed under the initial bombardment. The Division managed to seal the gap and the defences held for two days. On the western side of the pocket Marinovka and Karpovka were captured on the 11th of January. On the 12th, Russian forces reached the Rossoshka River. 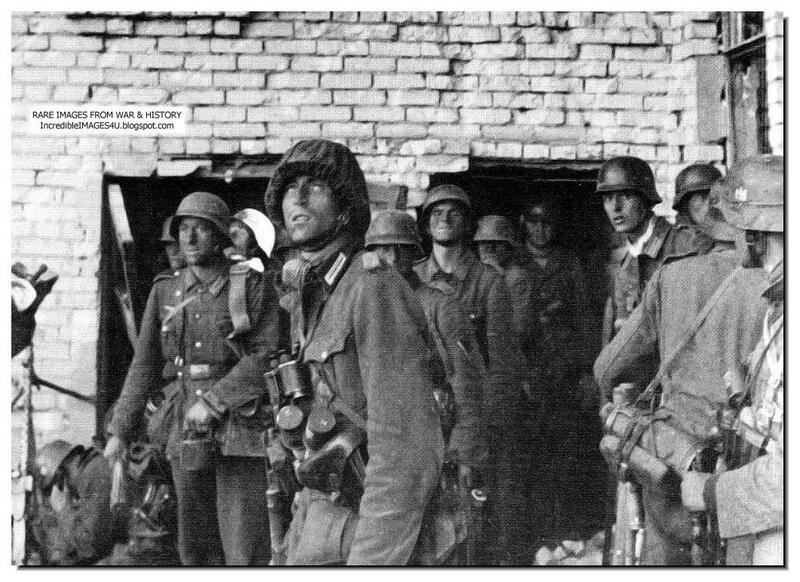 German forces, despite their resolute defence were now desperately short of ammunition and fuel. Bread rations had been cut to a mere 75g per man per day. The 29th Motorized Division had been almost totally destroyed and the remains of the 3rd Motorized Division had been forced to abandon their vehicles and heavy weapons due to a lack of fuel and continue the retreat on foot. The northern edge of the pocket had also been beaten back with the 16th Panzer and 60th Motorized Divisions suffering heavy losses. 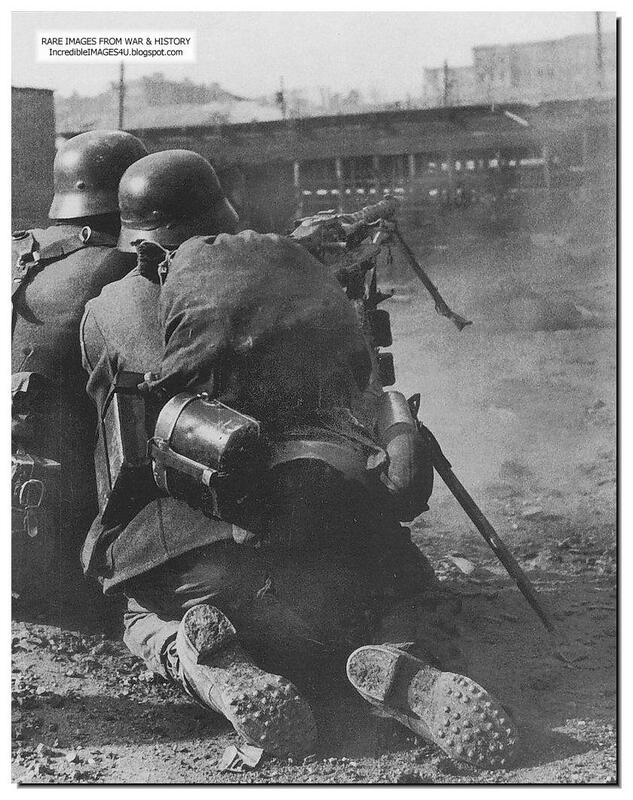 In the city itself, 62nd Army had launched attacks against the 100th Jager Division forcing it to lose ground. 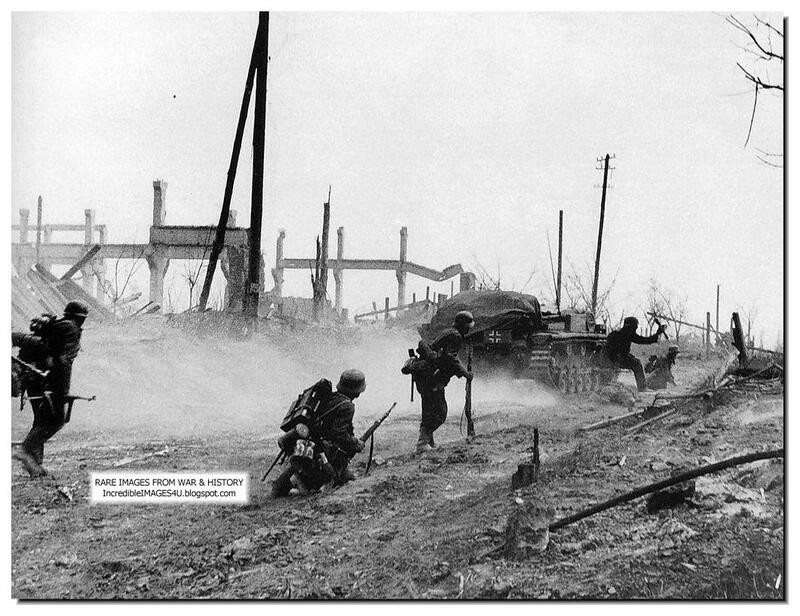 On the southern flank the 376th Infantry Division was cut off and then destroyed by advancing Russian forces. German infantrymen watch the planes of the Luftwaffe in the skies of Stalingrad, which bombed the Soviet building, paving the way for the ground troops to move into the command outpost of the Soviet 13th Guards Division. On the 16th of January Russian forces over ran the airfield at Pitomnik, destroying many aircraft on the ground as they tried to escape. By the 17th of January, 6th Army had been pushed into the eastern half of the pocket. The next four days remained relatively quiet as the Russian forces redeployed for the final push. On the morning of 20th January, the Russian offensive began again. The 65th Army broke through north west of Gonchara and pushed towards the airfield at Gumrak. Russian forces were within artillery range of the airfield the following afternoon. Evacuation of the airfield that evening descended into chaos. The only remaining airfield available within the pocket was Stalingradsky, a snow strip incapable of taking large aircraft. Only a few aircraft managed the hazerdous landing there and the air bridge all but ceased to exist. Despite the collapse of the pocket, isolated German units offered dogged resistance. 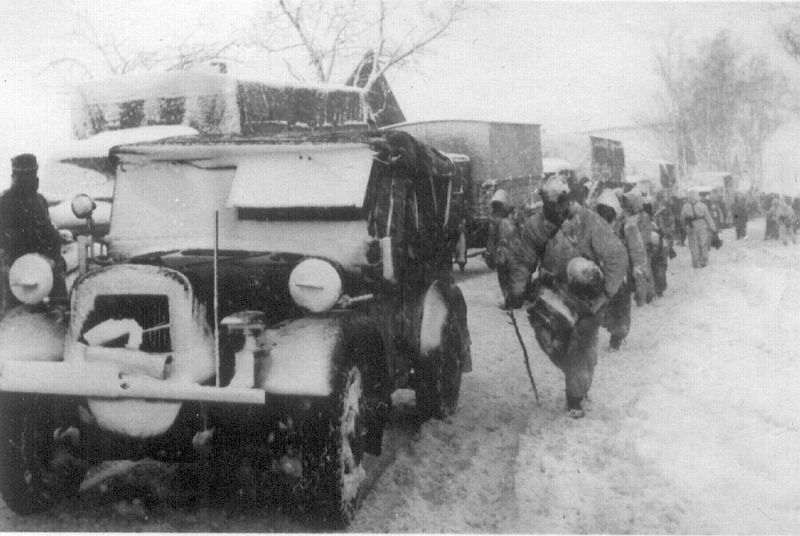 On the 22nd of January the remnants of the 297th Infantry Division were pushed back from the Voroponovo sector towards the southern outskirts of the city. The pocket now centered on the city itself. 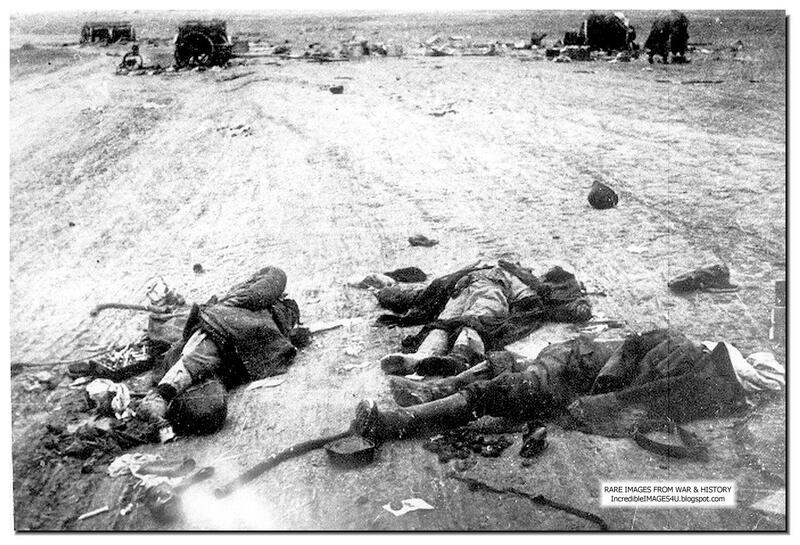 The Army had all but run out of food, fuel and medical supplies. The men were weak and exhausted, many thousands of sick and wounded packed into cellers in the center of the city. 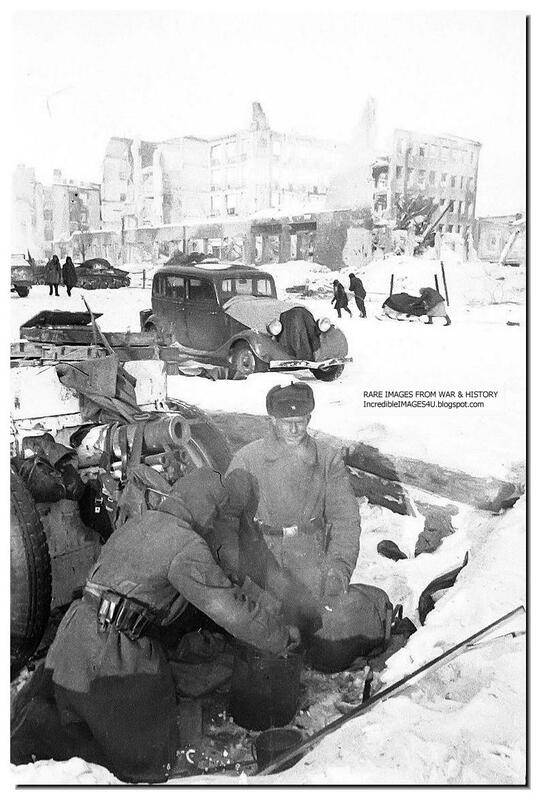 The Stalingrad theater was turned into a dressing station, but without supplies there was little the doctors could do for the wounded. Another dressing station was set up in the caves of the Tsaritsa Gorge. Cases of dysentery, typhus, jaundice and of course frostbite were rife. 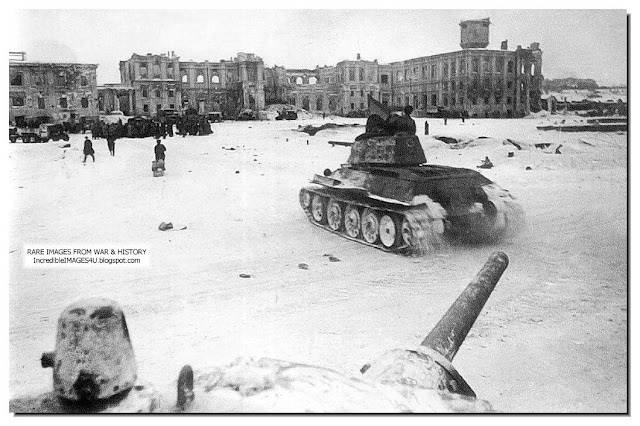 T-34 tanks in the central area of ​​Stalingrad on the day of the surrender of German forces in Stalingrad. January 31, 1943. 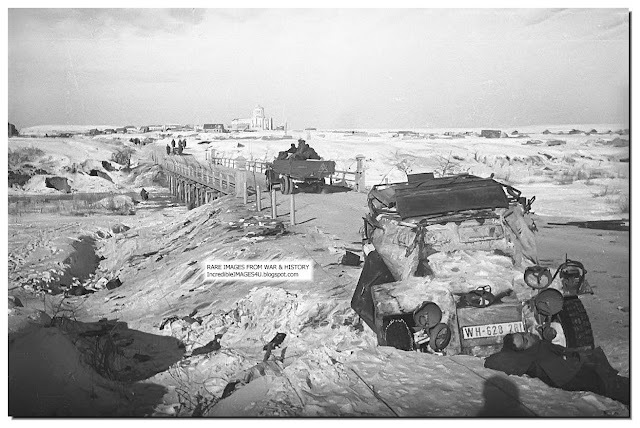 On the 26th of January tanks of the 16th Tank Corps, attached to 21st Army linked up with infantry of the 13th Guards Rifle Division, of the 62nd Army, to the north of the Mamayev Kurgan and the German pocket was split in half. The smaller pocket in the south of the city contained Paulus and the Army HQ in the Univermag Department store. The larger pocket in the north in the area of the tractor factory, containing 11th Corps and commanded by General Strecker. The southern pocket was reduced rapidly and by the 30th of January Russian forces had reached the center of the city. On the morning of the 31st Russian forces approached the Univermag Store and the city's red square came under heavy bombardment. At 09:30 a Russian officer entered Paulus's HQ and accepted the surrender of the forces in the southern pocket. However Strecker's 11th Army Corps still continued to hold out in the northern pocket. 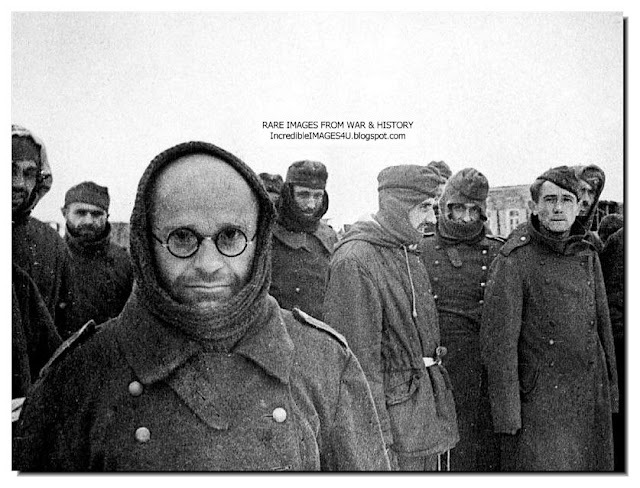 Finally, Strecker's divisional commanders convinced him of the futility of further resistance. On February 2nd, Strecker surrendered. German soldiers on the outskirts of Stalingrad. September 1942. 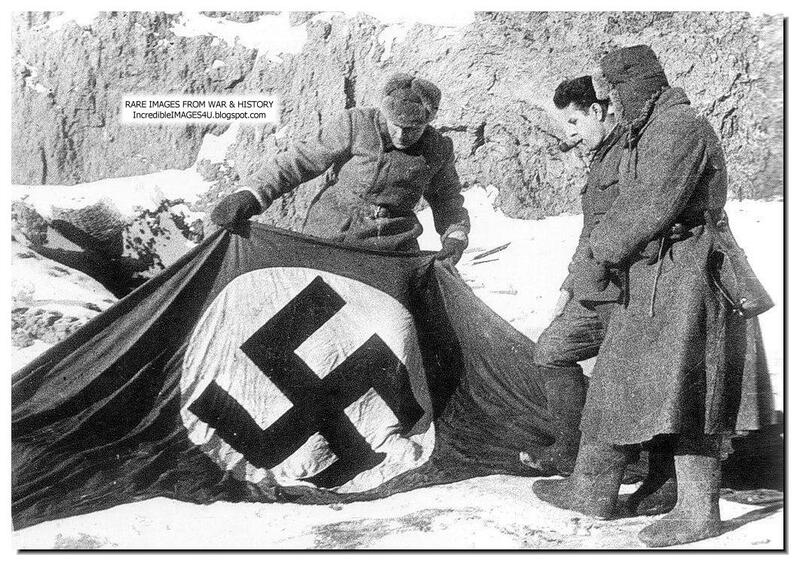 The Russian high command had lured the German 6th Army into a carefully laid trap at Stalingrad. 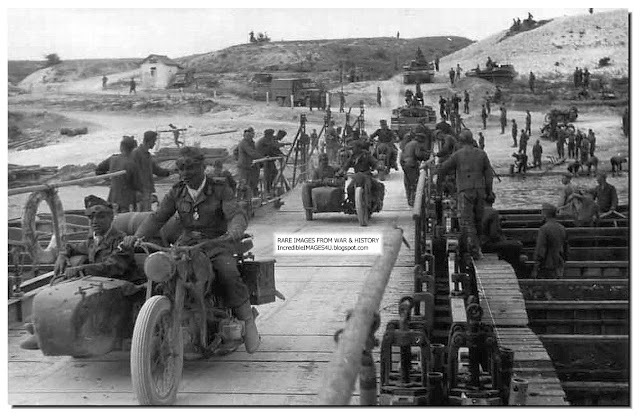 While it assembled its striking forces for Operation Saturn, it drip fed supplies and reinforcements into the city over the vital river crossings, in order to tie down the German Army as it attempted to capture the prize that Hitler wanted so badly. 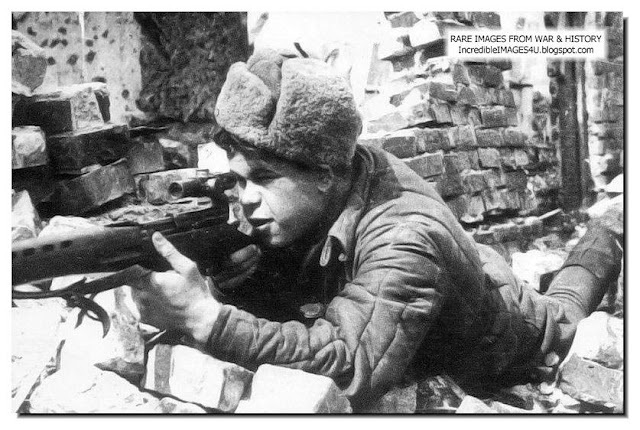 Russian shock combat groups and snipers turned the destroyed city into a fortress, where every room of every house on every street had to be cleared in vicious hand to hand combat, which swayed constantly back and forth. Once the trap had closed and 6th Army failed to break out at the earliest opportunity, its fate was sealed. The impossibility of keeping the Army supplied by air soon became apparent and it was left to bleed, starve and freeze to death in the rubble of the city. 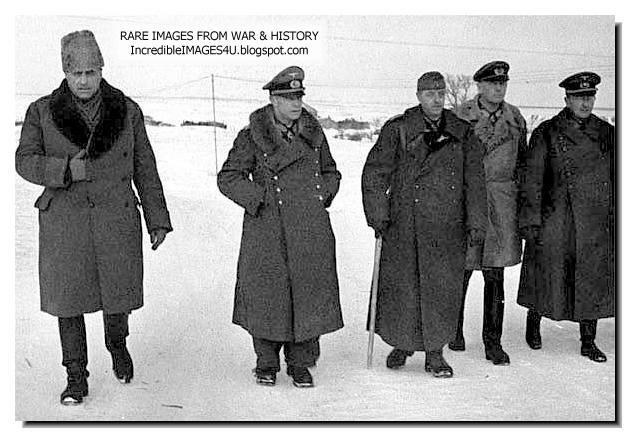 The fact that it fought on and tied down sufficient forces to allow a partial restoration of the situation on the German southern wing, may in some way justify the sacrificing of the Army on the Volga. However this was a disaster of uncompromising magnitude and the strategic balance in the east had passed almost completelyoon became apparent and it was left to bleed, starve and freeze to death in the rubble of the city. The fact that it fought on and tied down sufficient forces to allow a partial restoration of the situation on the German southern wing, may in some way justify the sacrificing of the Army on the Volga. However this was a disaster of uncompromising magnitude and the strategic balance in the east had passed almost completely to the Russians. 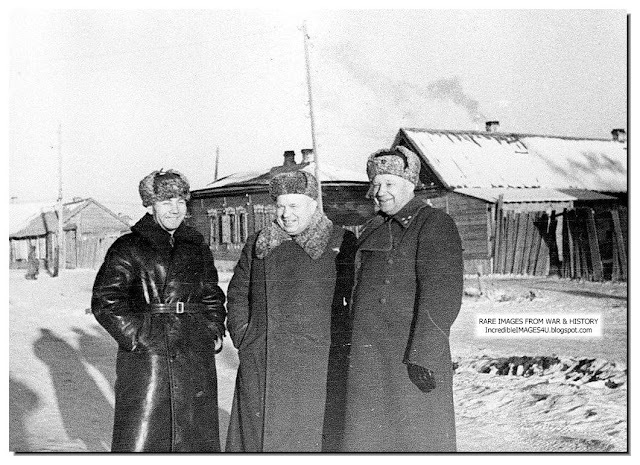 N S Khrushchev of the Soviet Military Council commanded the 64th Army in Stalingrad. February 1943. August 1942. Stalingrad during a devastating German Bombing raid. The Luftwaffe bombed the city into bits. The thinking was it would submit quickly. 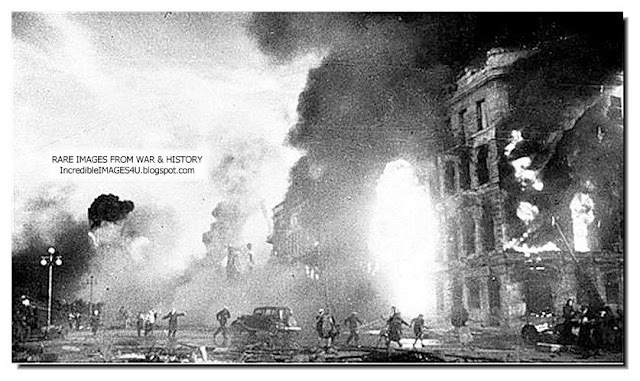 The Russians did not surrender and the ruins of the city greatly hindered German tank movement. Hence the familiar Blitzkrieg tactics could not be applied here. Street-by-street fighting occurred; the Germans were not very adept at that. 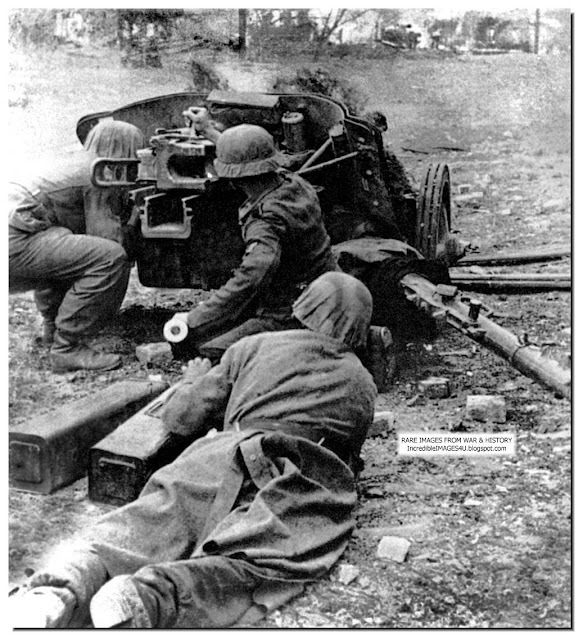 A Russian gun fires at German positions. Winter 1942. February 1943. Dead German soldiers piled up in the snow. 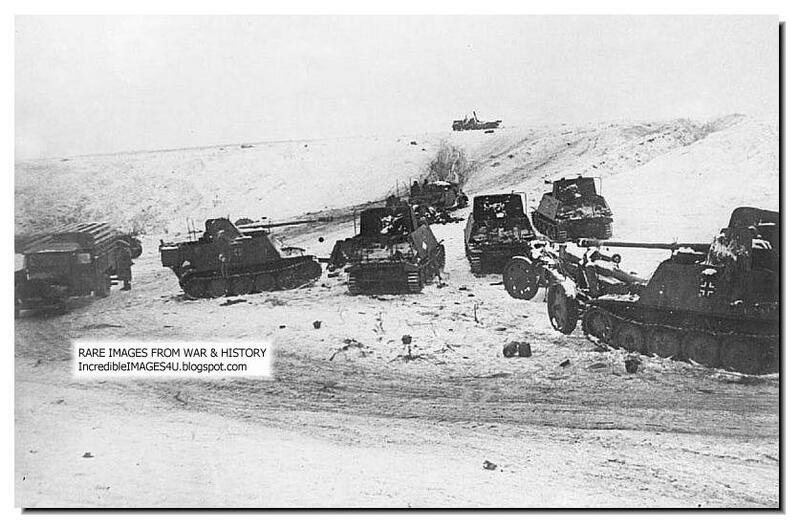 German tanks lie around on the outskirts of Stalingrad. In the last stages there was no fuel to run them. German Army Group "Don" withdraws after it failed to relieve the Sixth Army trapped in Stalingrad. The Sixth Army was doomed. 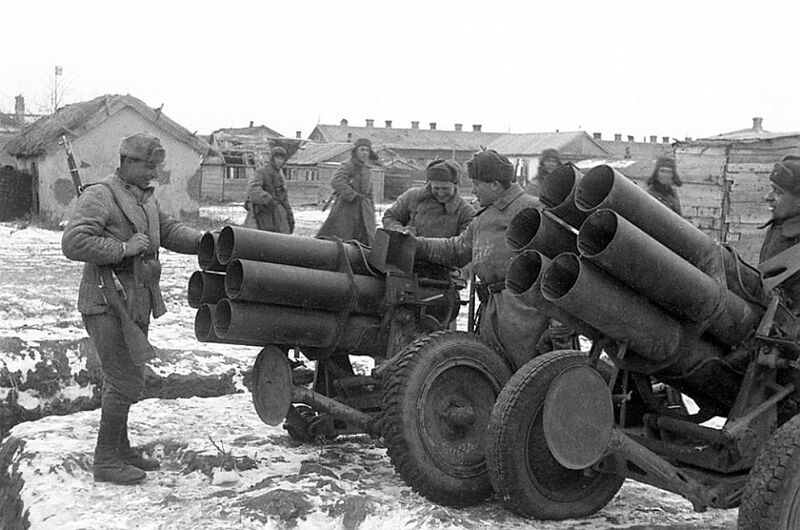 Russian soldiers examine a German multi-barrelled mortar; the "Neberlwerfer"
Wow! Great pictures. All victims, some perpetrators. Thanks. Congratulations for the article and the photos. Greetings from Romania ! No truth just red lies . Sad you would not put up what I said USSR has killed more humans then any other in history Yes count all the off shoots China ?